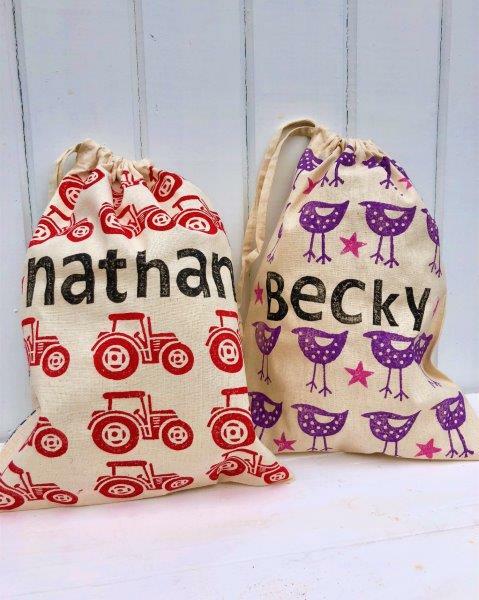 For these personalised block printed bags we used the Large 26x35cm Drawstring Bag which is a great size to be used as a Toy Bag, Small Clothes bag or the perfect Shoe Bag! Making great presents for Children as you can personalise with a name, funky pattern and favourite colours! These would also make great present for adults, make them a bit more grown up by swapping the design for something more detailed. 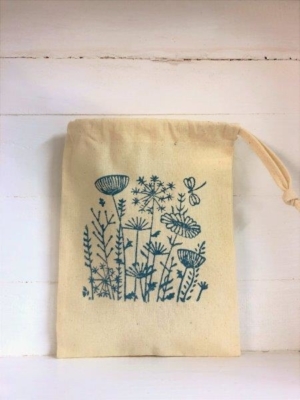 Drawstring bags make great storage bags, I’ve been thinking about making one for a friend as a knitting bag! 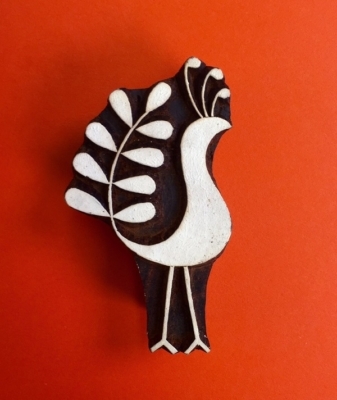 Or make yourself one to keep all your Indian Printing Blocks in! 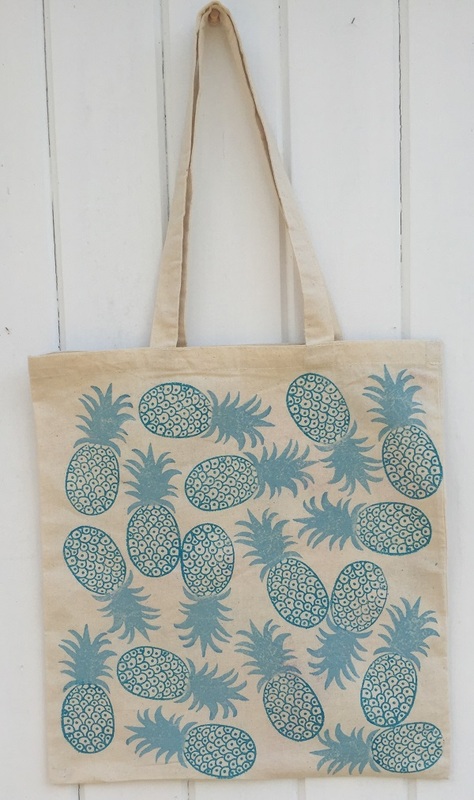 We also sell an Extra-Large Drawstring Bag which would make a great Laundry Bag! 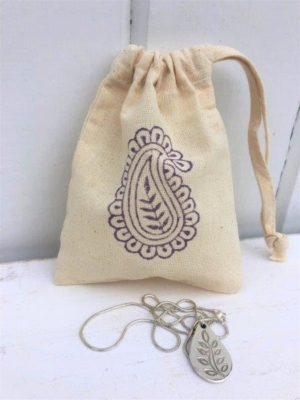 Perfect bag for a little present or to keep your special Jewellery in. 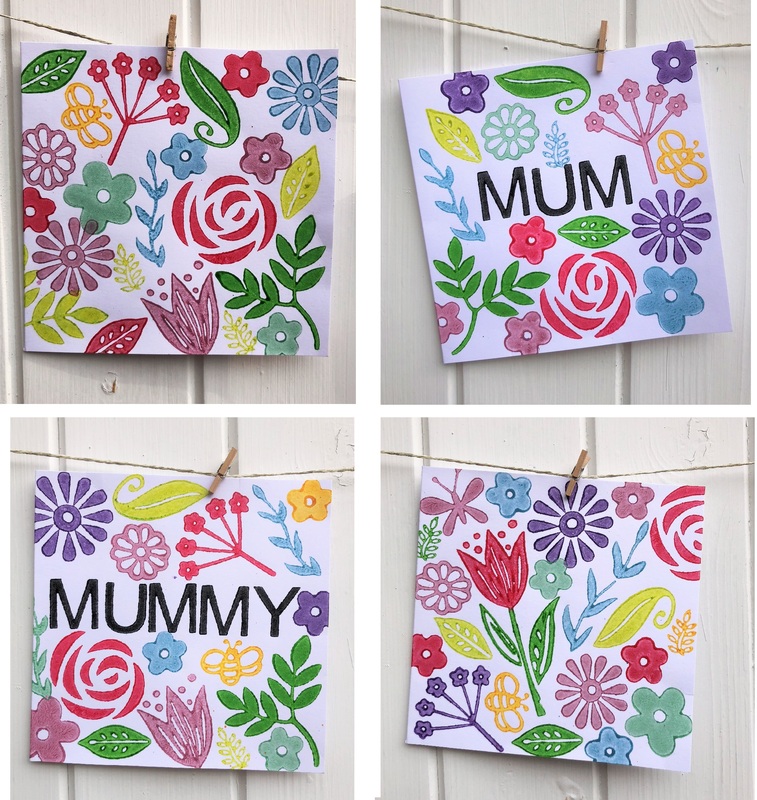 These look great with just one print in the middle, and you can even personalise with a letter in the corner to make it that extra bit special! 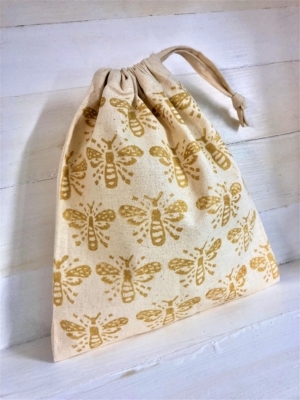 This is one of our favourite drawstring bag samples that we did, the medium Detailed Bee block printed in Glorious Gold SoSoft fabric paint looks fabulous! 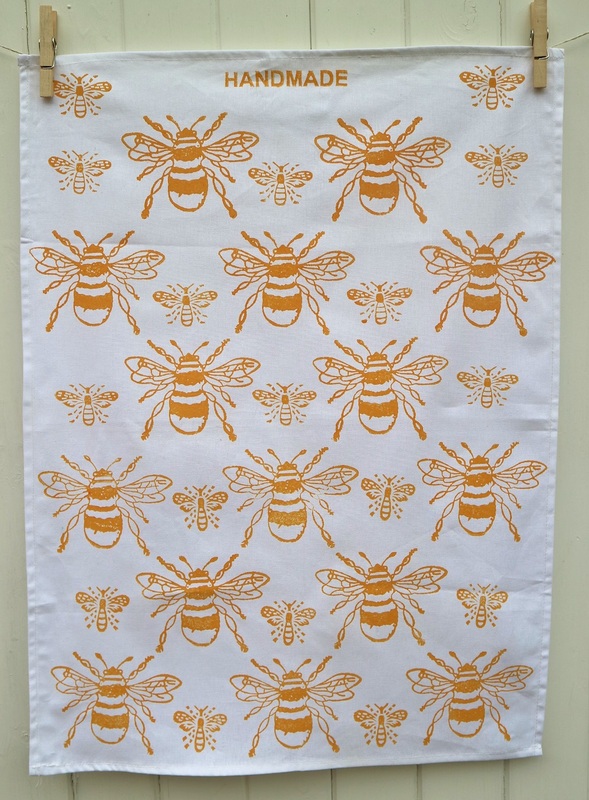 It’s such a popular design we knew this would be a really popular way to use it, who wouldn’t love a beautiful bee bag! 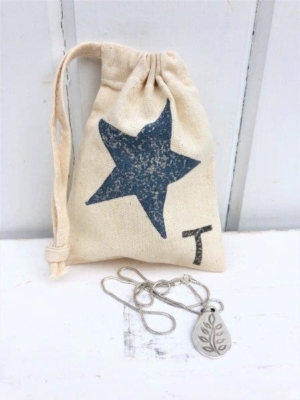 Another idea for the Medium Drawstring bag is to use it as a wash/ make-up bag. 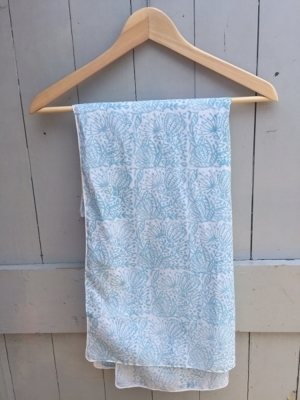 If printed with fabric paint it can be washed whenever you want, so you don’t need to worry about it getting a little dirty. 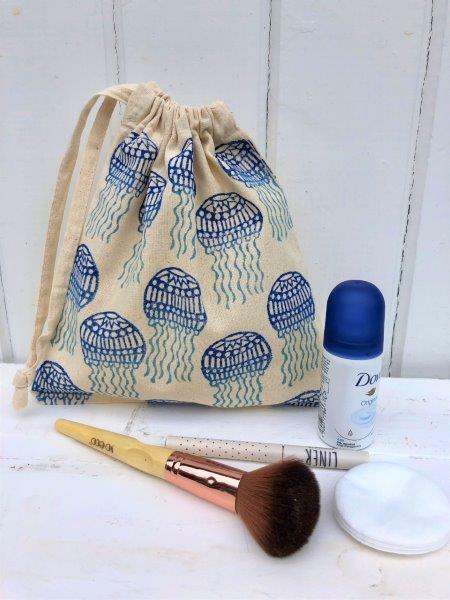 On this Jellyfish wash bag, we printed with two colours which were Brilliant Blue and Duck-Egg Blue Fabric paint, love the mixing of the two colours! 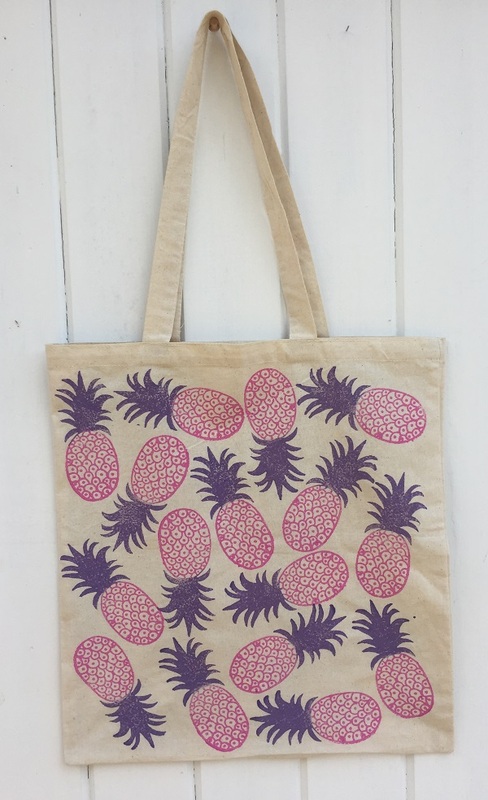 Great to make for yourself or as a present! 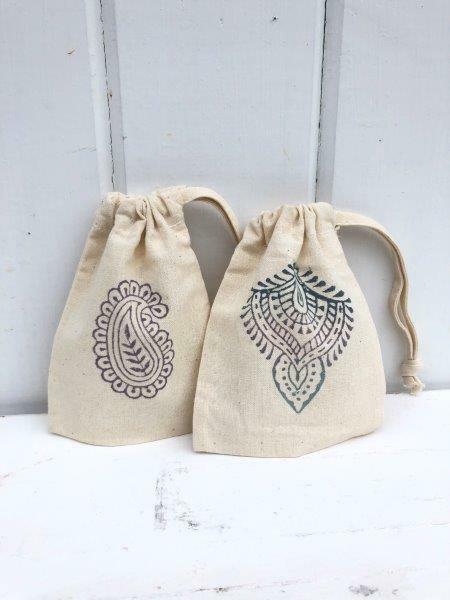 Lots of ideas on how to use block printed Drawstring bags this Christmas, here in the office we always make each other a handmade gift and these would make great bags to put all those little present’s in! 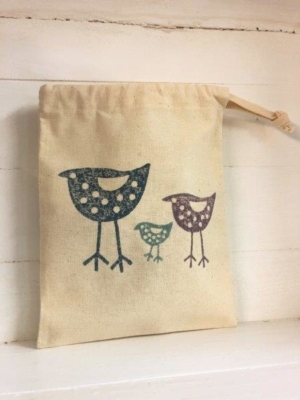 A great use of our largest size drawstring bag would be to print your family a Christmas Stocking each, you could even personalise with their name! 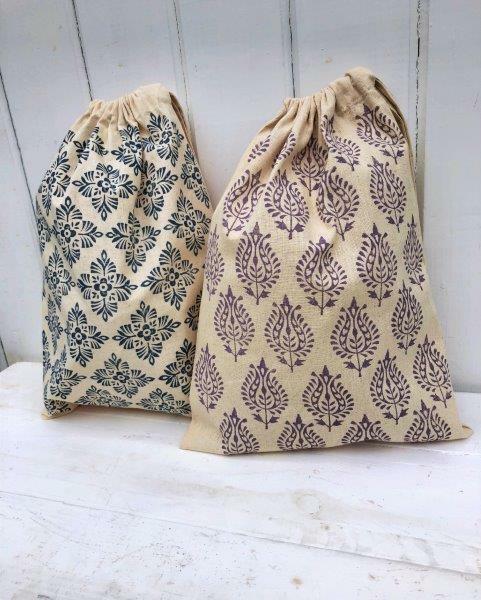 More lovely block printed bags this time onto the Small Drawstring bag! 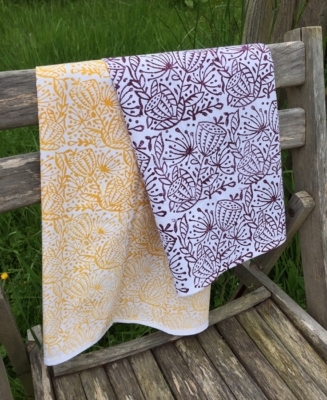 These could also look really lovely with hand embroidery over the top to embellish the prints a little, and add a bit of extra detail. 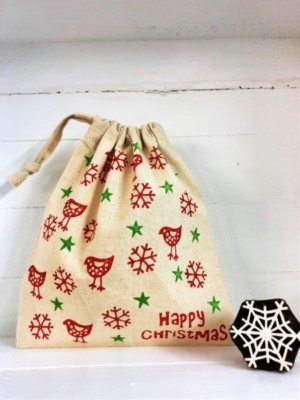 Great size to package a small present in or to use as a small storage bag. 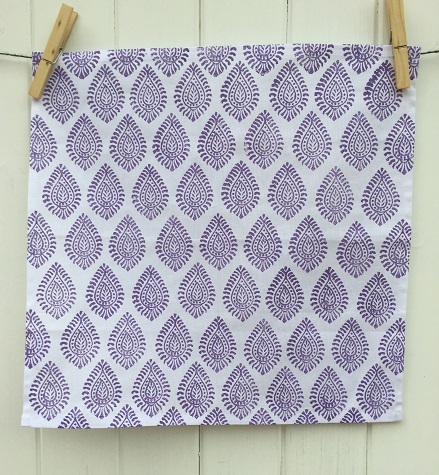 *PRINTERS TIP* – If your foam mat is too big to put inside the drawstring bag make sure you put a piece of paper or card inside the opening so the paint doesn’t go through to the other side, but still keep the mat underneath you so you’re still printing onto a soft surface! 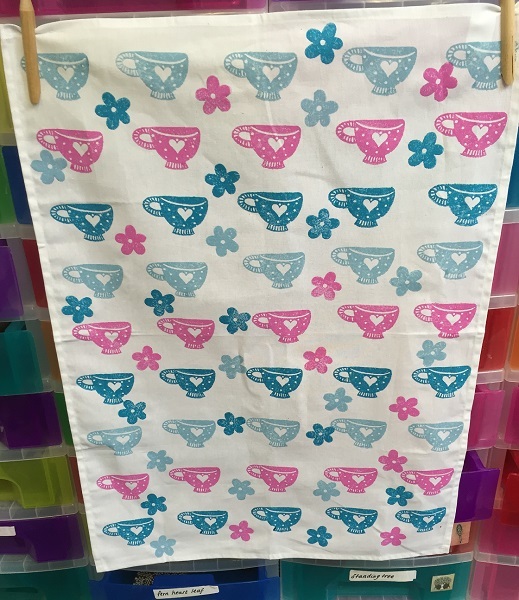 We hope this has inspired you to try printing your own Drawstring bags, you can find the full range of sizes available to purchase under ‘Block Craft Fabric Blanks’ along with lots of other ready made fabric items for you to Block Print. Click here to head to head to the right page…! 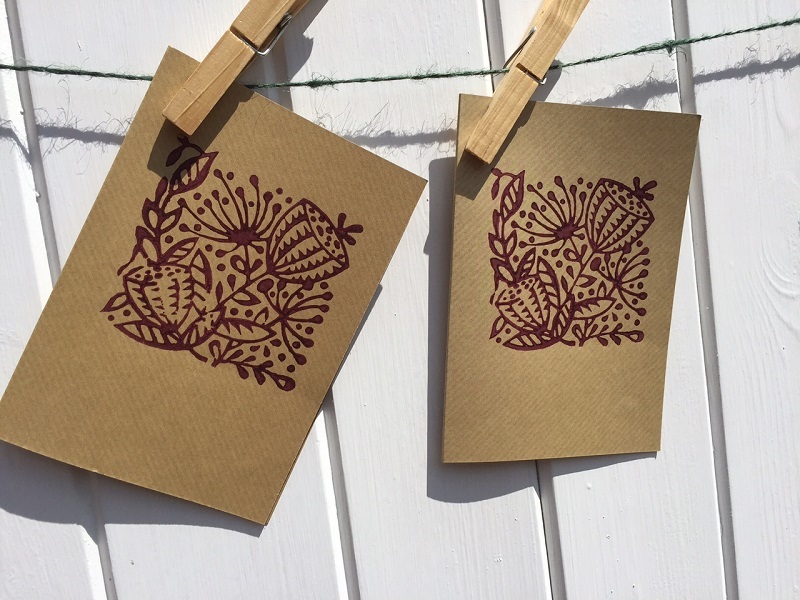 Why not create something really special this Mother’s Day, and block print something that will be kept forever! 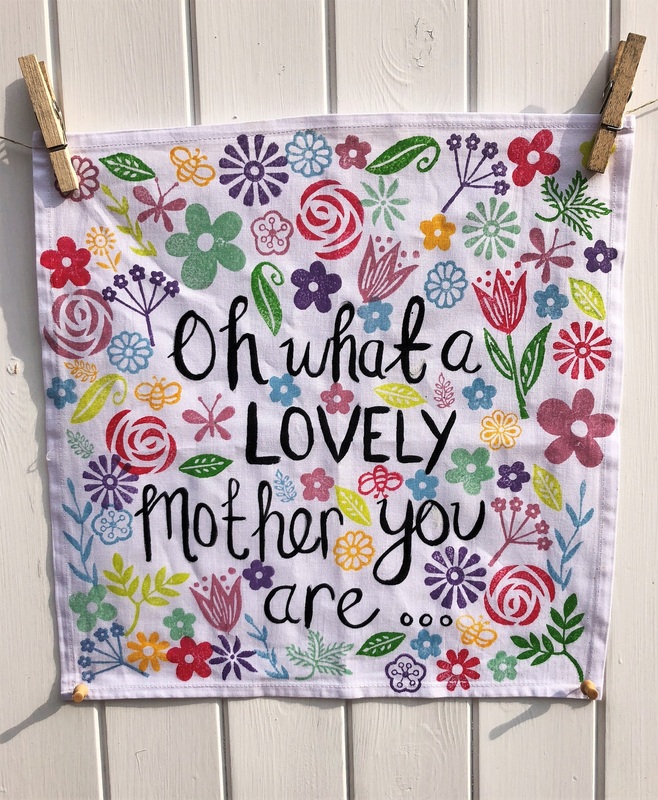 It doesn’t just have to be just for your own mum, why not share the love this Mother’s Day and make something wonderful for your Grandma’s, Sister’s, Auntie’s, Step-Mum or for a friend who is just a wonderful Mum!! 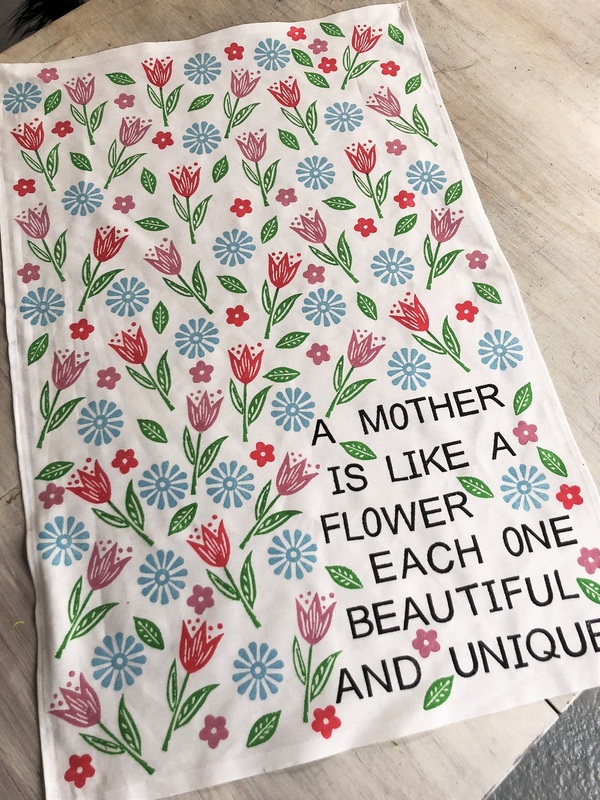 It’s the perfect time to let the important women in our lives know how much we love and appreciate them, because it’s easy to forget to tell them… and the perfect excuse to do some beautiful Block Printing! 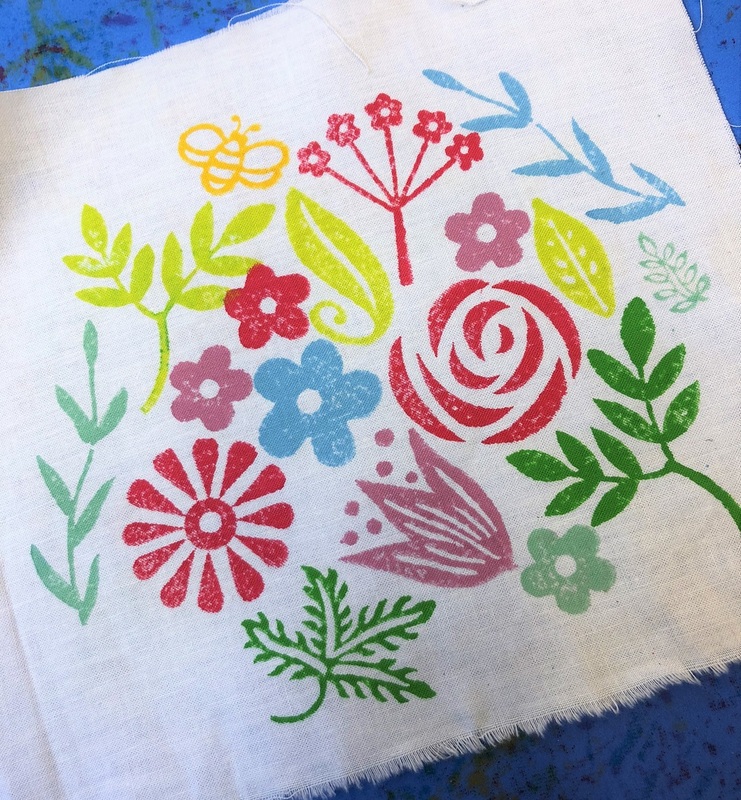 This style of printing really is really very fun and requires no skill, it’s easy enough for everyone to have a go at and we have plenty of tips to help you along the way! 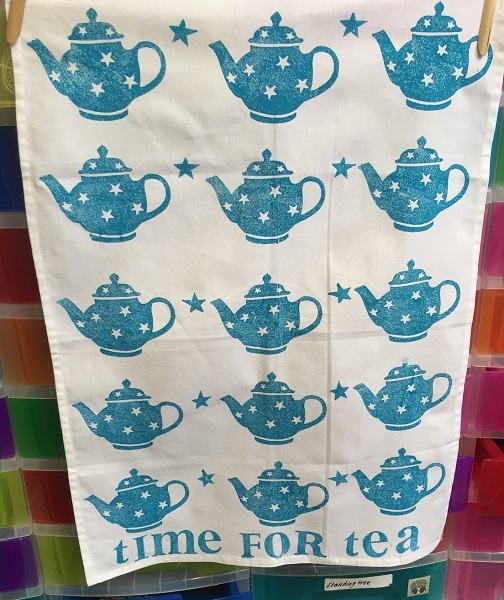 We’ve been busy printing Napkins, Cards & Tea Towels hoping to inspire each of you beautiful crafters to get your paint out and start printing! 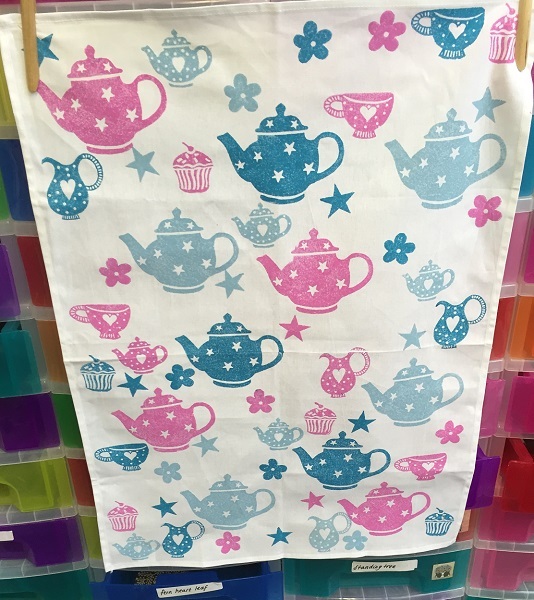 Firstly, we wanted to find a mix of lovely spring colours, pastel tones but also wanted bright colours to make the printing really pop! So, we played around for a while and decided on a mix of 8 colours. Throughout the various printing we did we may only use a couple of colours at a time, you don’t have to use them all together! 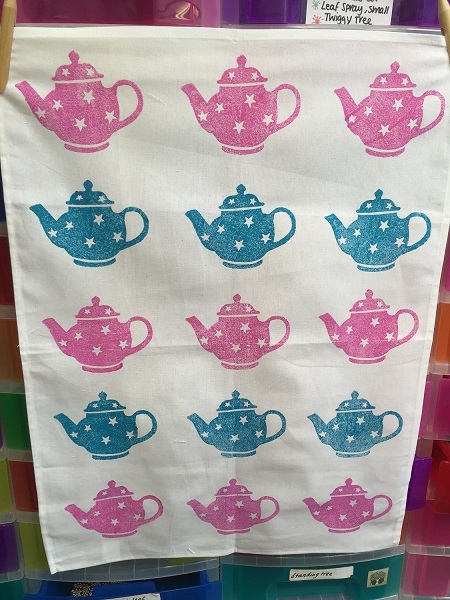 But having a good mix of colours really helps when your printing with an assortment of designs! 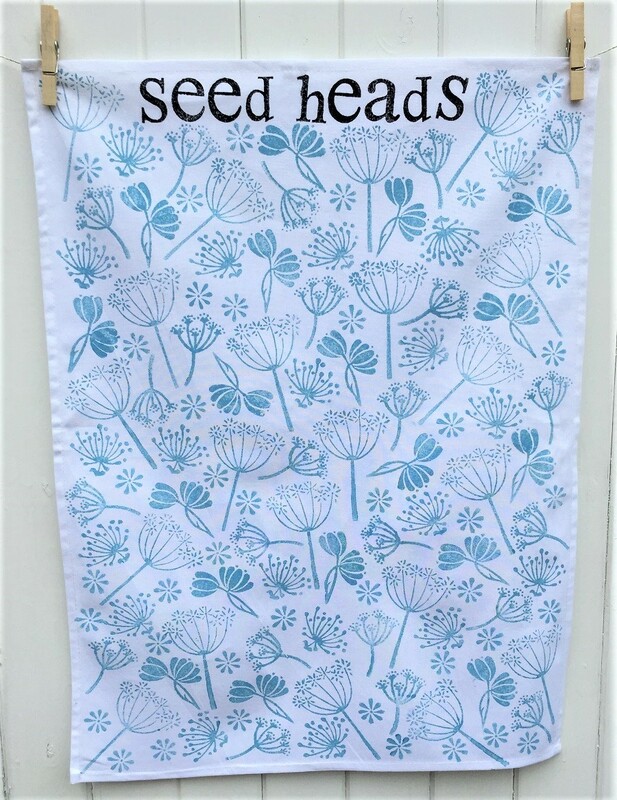 For this Mother’s Day we wanted a nice mix of Flowers & Leaves, but you could use any designs you have at home, Seed Heads would also be pretty with this style of printing! 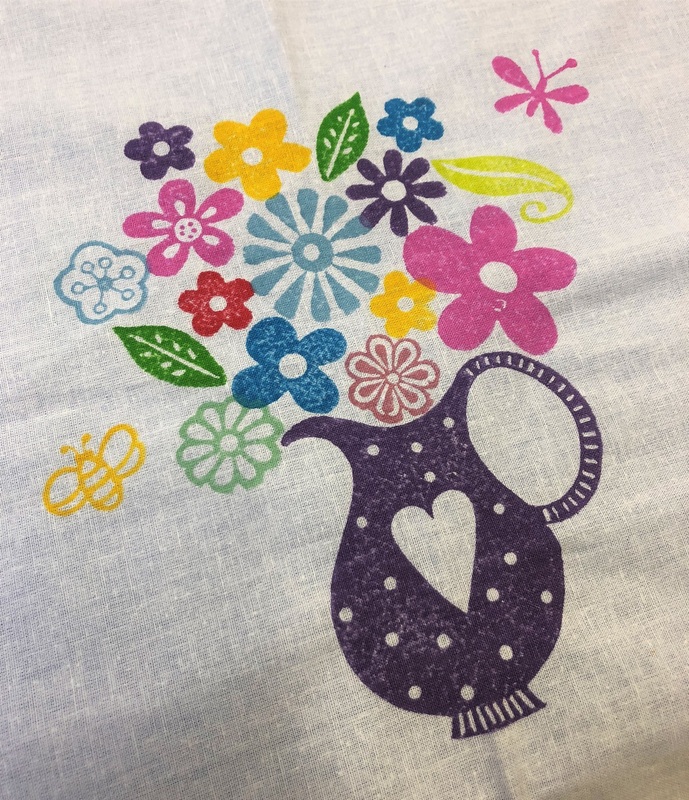 You can use as many or as few blocks as you have / want to use, sometimes is nice to have a big mixture of designs but this can give your block printed item a very ‘busy’ look … so you can keep it a bit cleaner by using fewer designs! 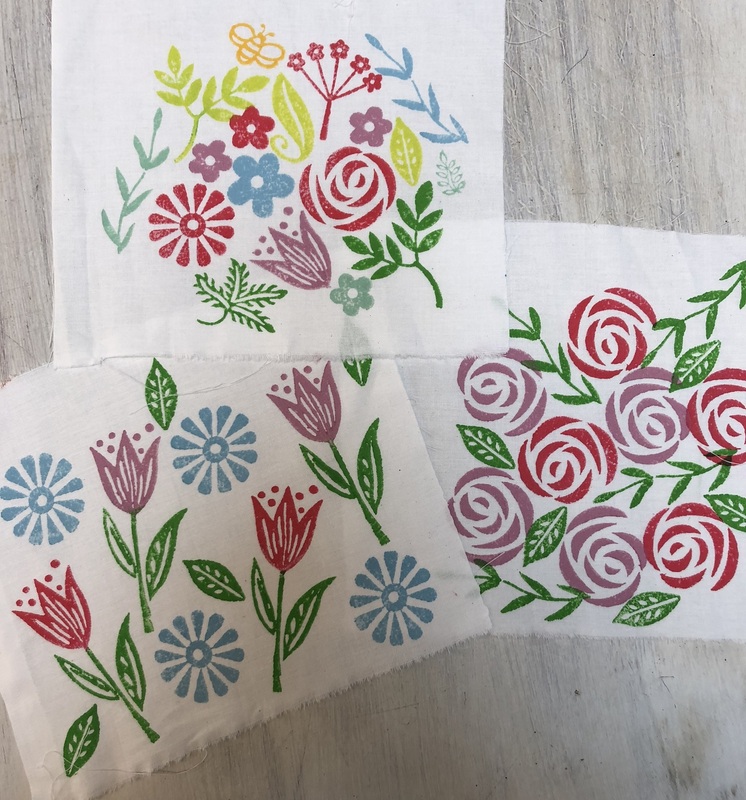 We always like to play around practicing designs first on scrap fabric (you can always embroider this fabric after or cut the prints out and stick them onto card!) 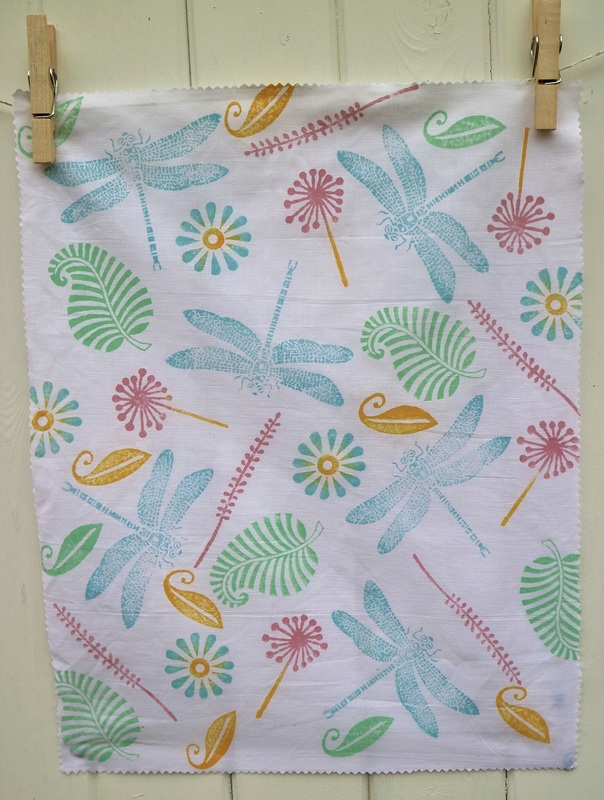 Find yourself any old fabric or even cheap paper so you can have a play and see what designs & colours you like! 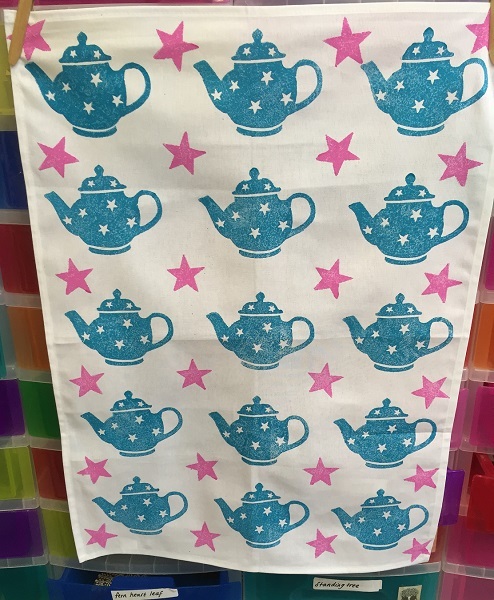 First design we tried was one using lots of printing blocks & different colours, you can see a few step by step photos of how we built up this design. 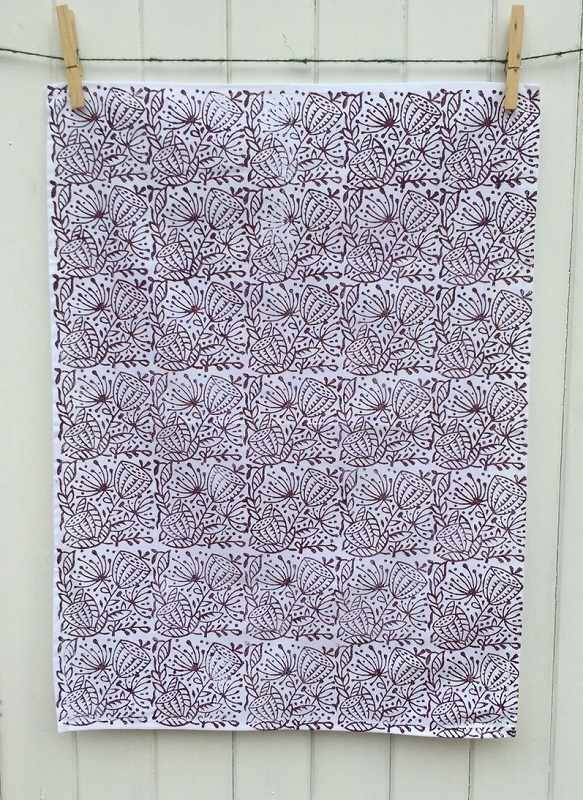 With this style of printing we find it best to start from one corner, and build the pattern up from there, filling in any spaces with smaller blocks and trying not to put the same colour too close together! It can take a while because you keep swapping blocks and changing colours, but it gives you such a fabulous over-all look we don’t really mind! 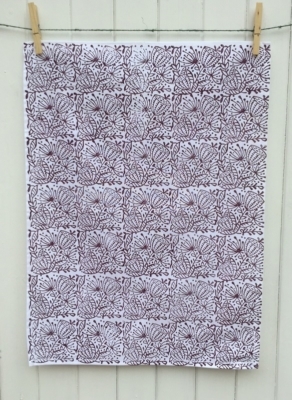 Here is something a bit simpler only using 4 blocks and 3 colours! 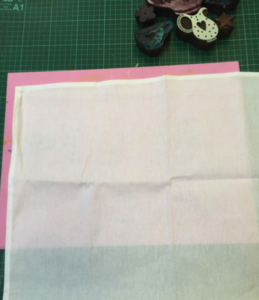 First start by printing the biggest block several times, and then you fill in the gaps with the smaller blocks. You can see below how the pattern builds up! Now this is a design we stole from a customer of ours as we loved it SO much! 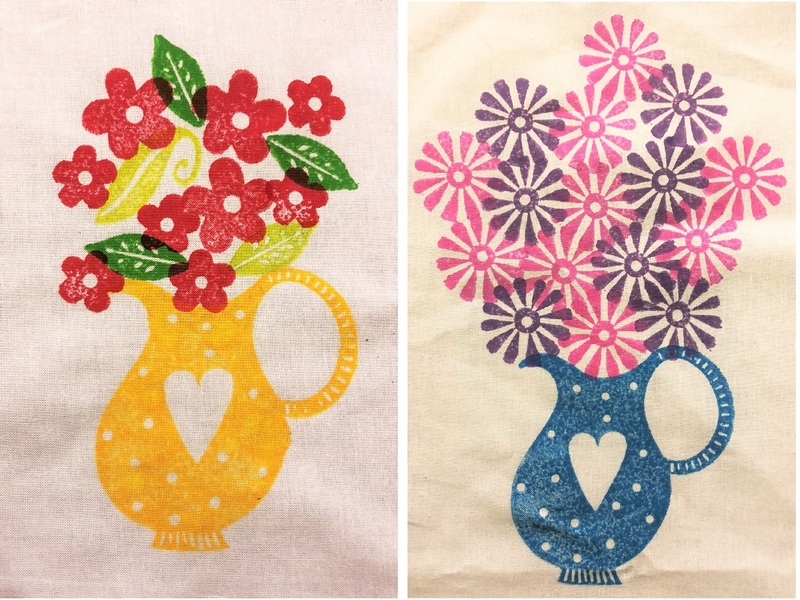 A lovely lady printed a jug full of flowers on one of our workshops and we fell in love with the idea! 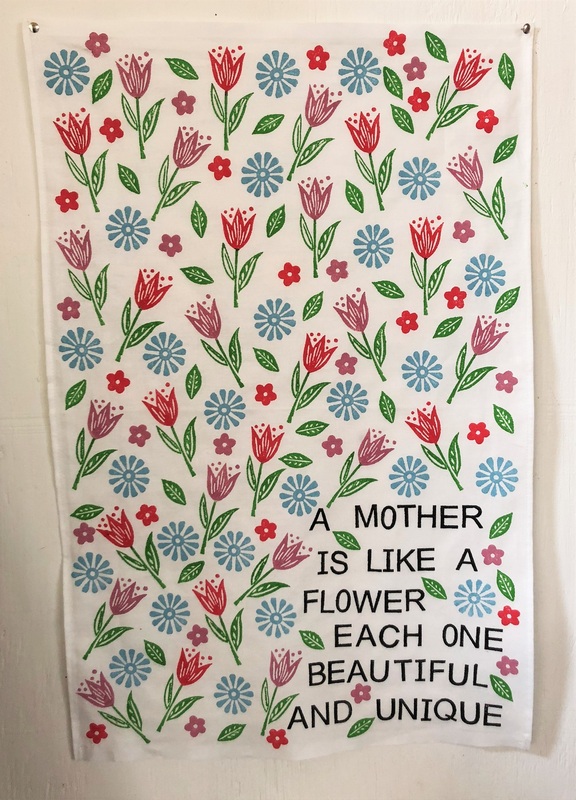 You can see a couple of variations of the design below, some using several different flowers & leaves to build up the design, and one piece just using one flower and a couple of colours! 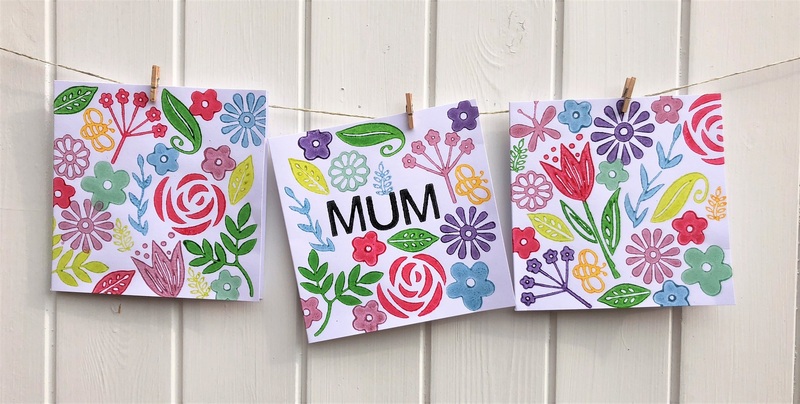 It’s such a clever idea and easy to do, we think children would love to print this design as you can make it as crazy and as colourful as you want! Here’s a few step by step photos to show you how we built up the design using lots of assorted colours and blocks! It would be a lovely design to print onto some good quality card and frame to have on display! Oh my Gosh! Just look at these cards! Don’t they look fabulous…. 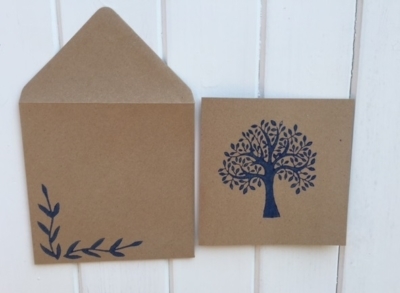 We don’t sell plain white cards, so I took a quick trip to a local craft and brought a pack of 50 plain white cards & envelopes! 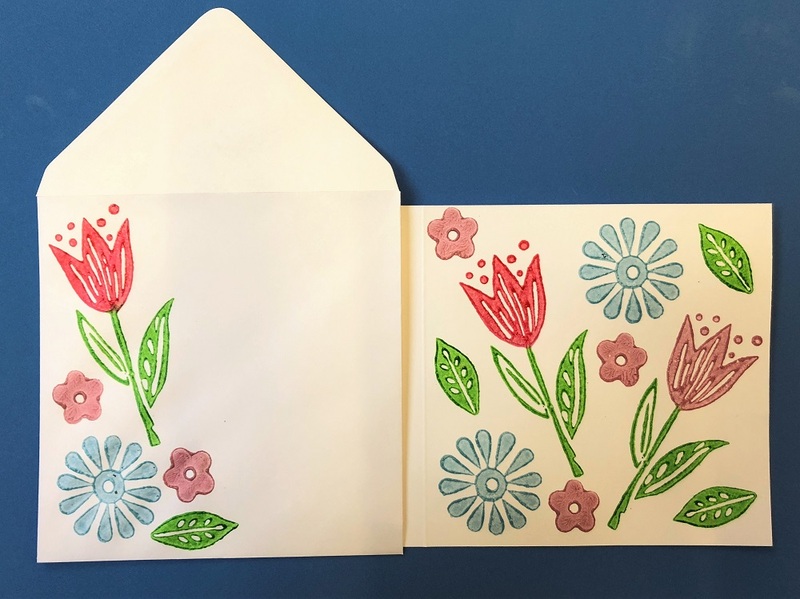 With the colours that we are using here I thought they would show up much better on white paper than on brown, but if you’re using darker colours brown or coloured cards would be perfect! 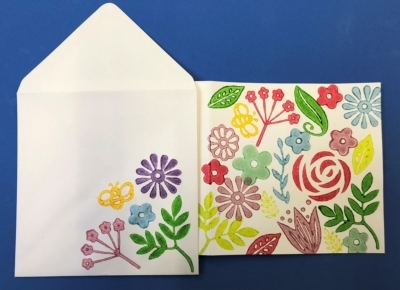 Have a go printing your design exactly the same but onto your cards, don’t forget to print the envelopes too as they look so much more interesting! We are so happy with the finished cards, we just want to print them for everyone! 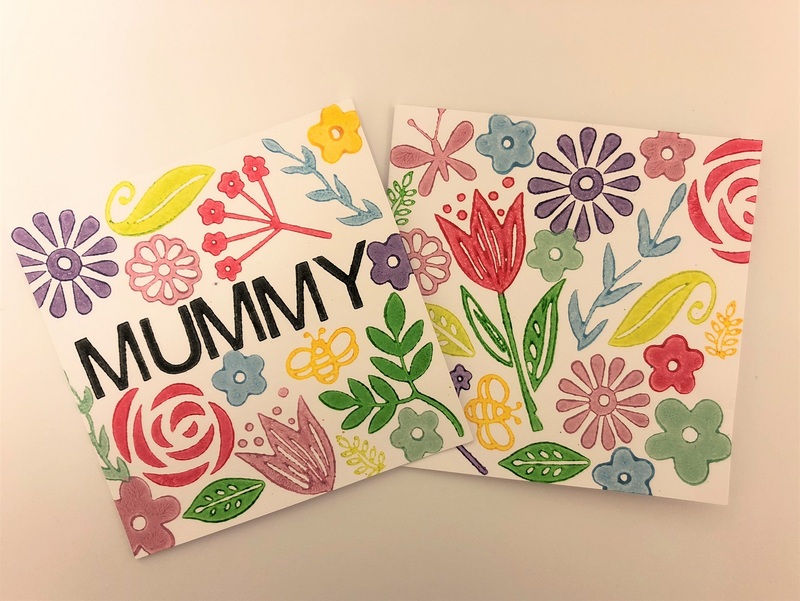 It’s a fabulous design using an assortment of designs and colours which all work well together, and not just for Mother’s Day, these would make lovely Birthday & Thank You cards! We did try something a little different which we hadn’t done before… a bit of brush lettering! Which we really enjoyed and loved the results! So, if you don’t have an alphabet set why not find a paint brush and paint your wording on! 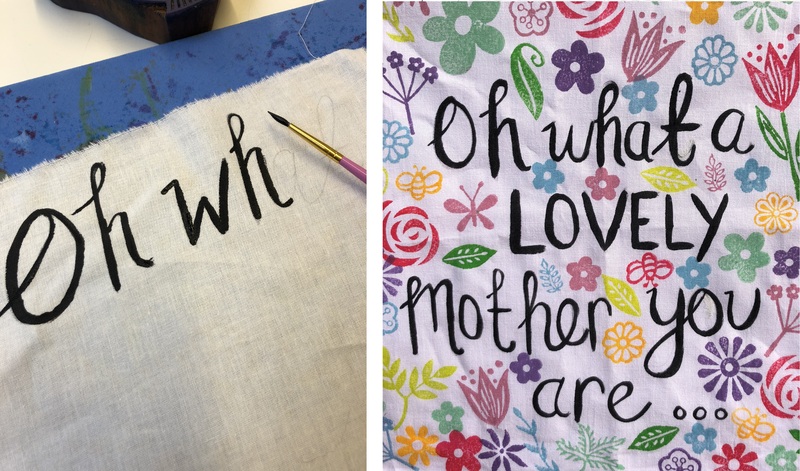 We had a practice first and then wrote the text onto the fabric first with pencil which I just went over with the paint! It’s quite hard to get perfect so it’s a bit more of a rustic look but we really like that! We have a exclusive offer for you since we always sell out of these designs before Christmas we are giving you a head start to get them for yourself, with a 10% Discount off all 22 designs in our new ‘most popular of 2017’ category! This offer will only last until the 13th November or till they sell out, so don’t wait! category and see the full range of designs which have a special 10% discount! 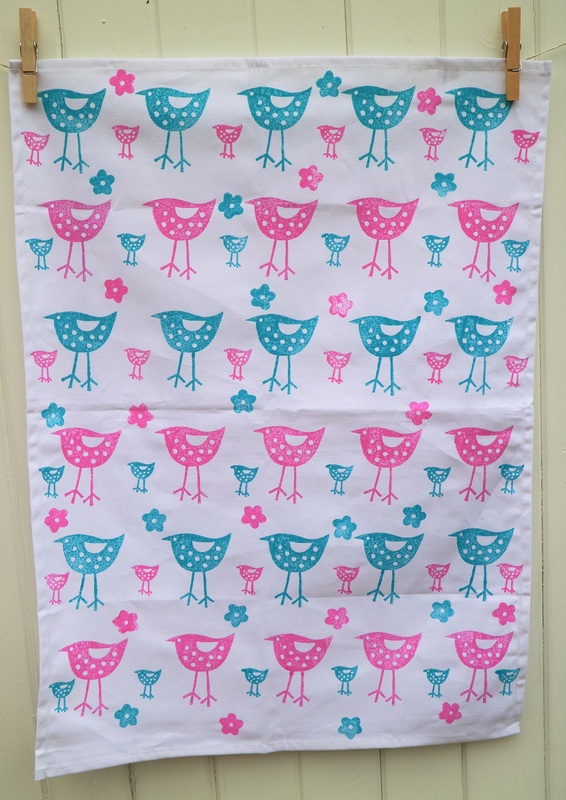 How funky are these new designs, they have totally been flying (no literally) off the stand since we got them! 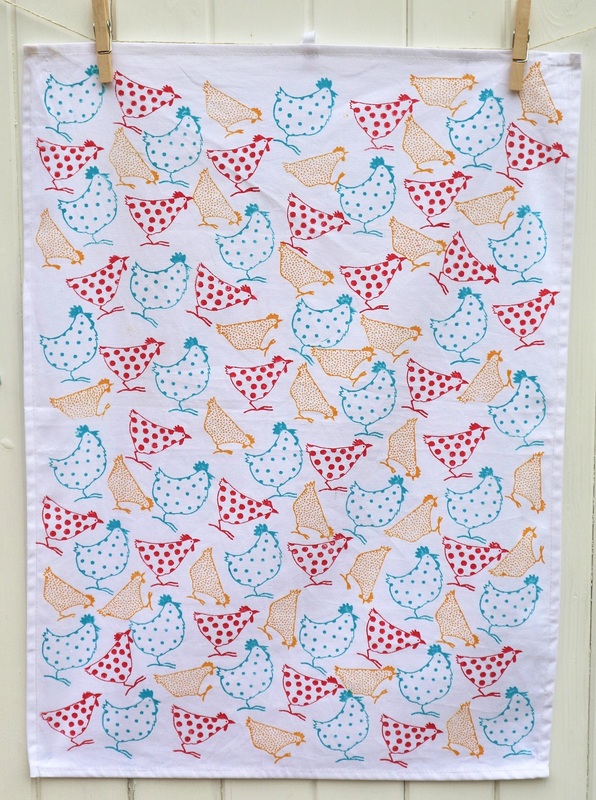 Lots of chicken Tea Towels are going to be printed this year for Christmas! 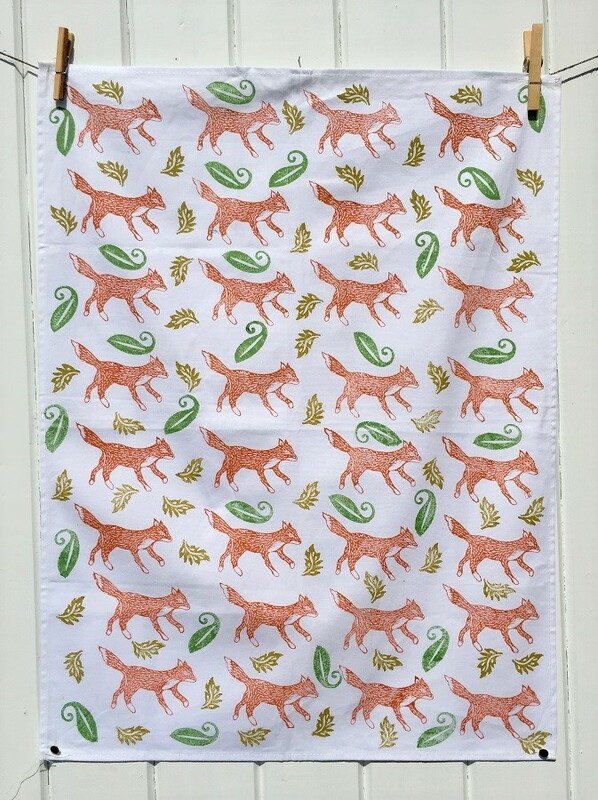 Our lovely Running Fox – has been a firm favourite this year, we can’t stop printing Fox & Leaves Tea Towels! 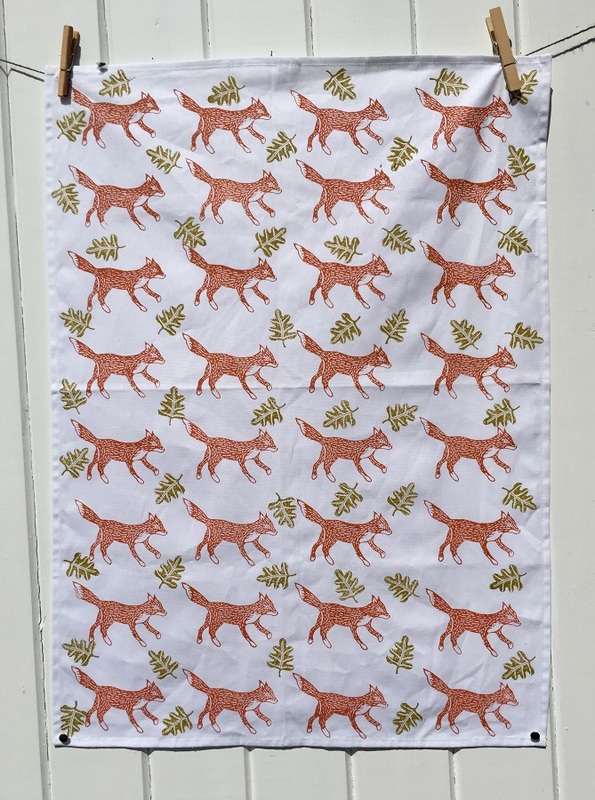 I think there may be a lot of Foxy Tea Towels given this year for Christmas! 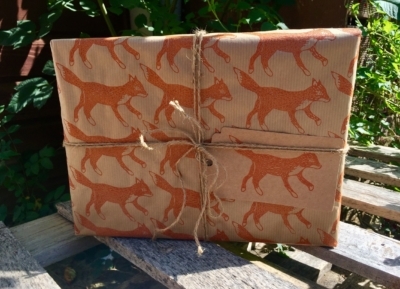 Love the mix of earthy colours (we’ve been using Terracotta, Olive Green & Olive Brown Fabric Paint) Also the Fox Wrapping Paper is very stylish! 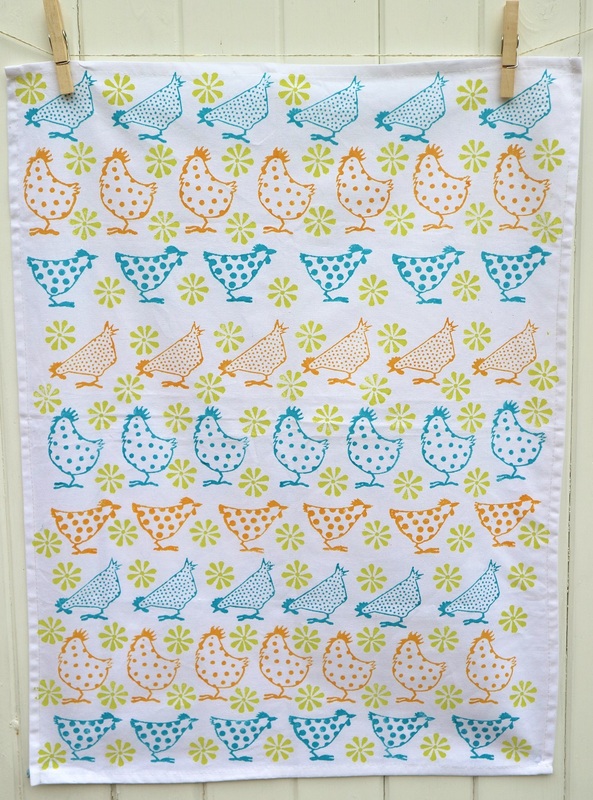 Large Funky Bird – One of our most popular blocks for using 2 colours on, he looks magical with a different colour body & tail! 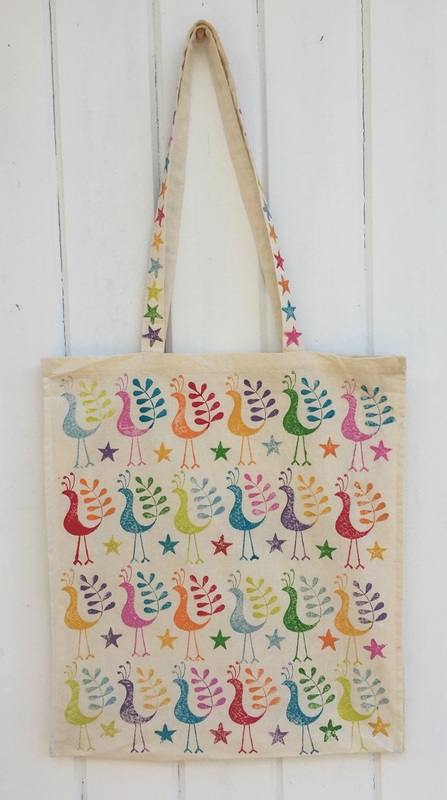 This Tote Bag design has been SO popular with a mixture of bright colours- I’m sure he would also look fab on a card! 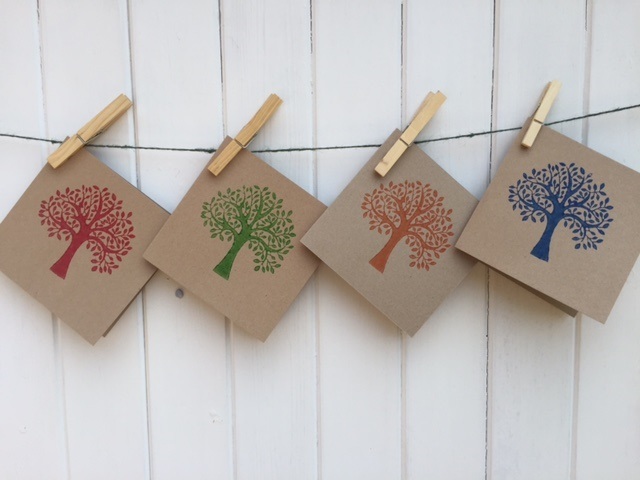 Our most popular Tree design, also part of our Tree’s & Leaves Printing Set! 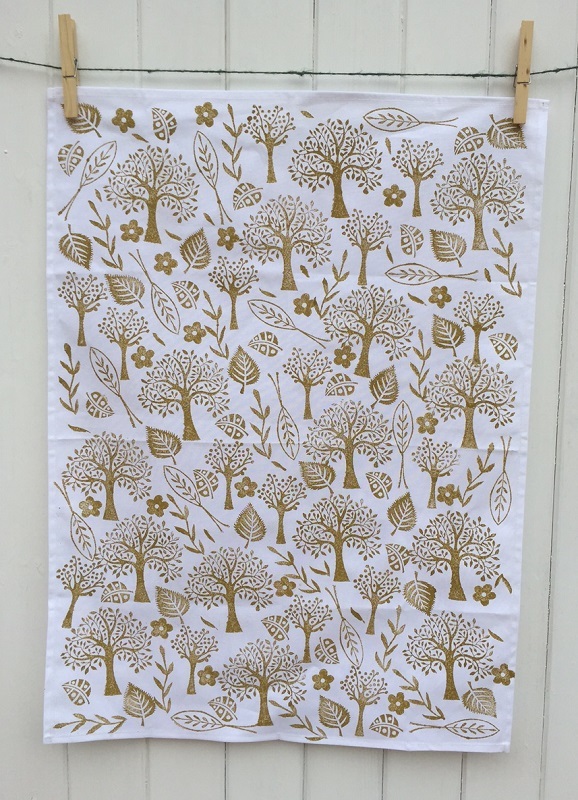 Would make a fantastic tree for Christmas if printed with Gold or Silver! 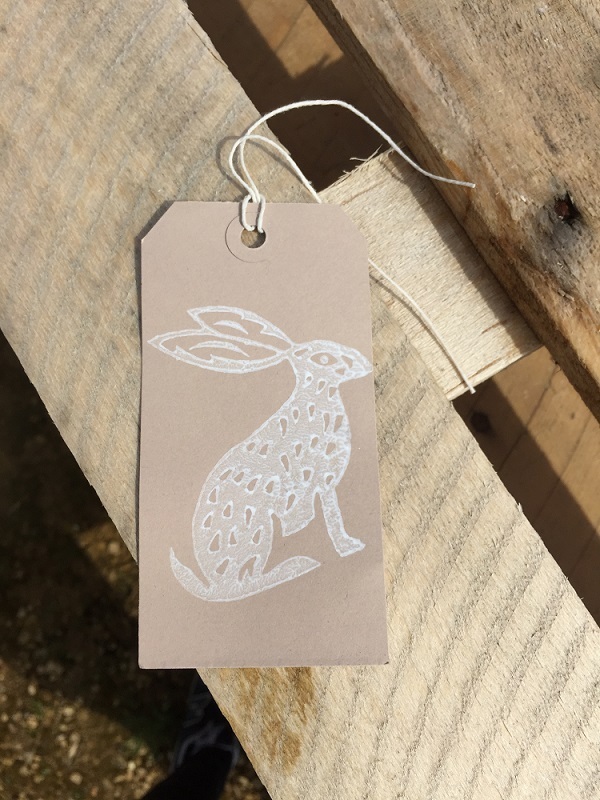 Our Sitting Hare is a design that never stays in stock for long, as one of the most stylish animals at the moment, he’s always in demand! 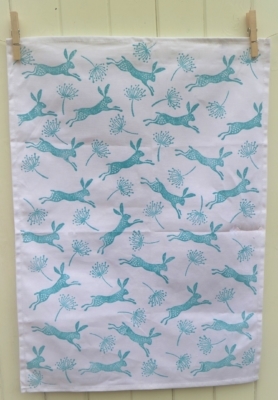 Hare Wrapping paper is our all-time favourite and never goes out of fashion and our Hare Tea Towels are always loved by all, it’s a fantastic alternative to the normal boring Christmas Wrapping Paper you buy from the shop! 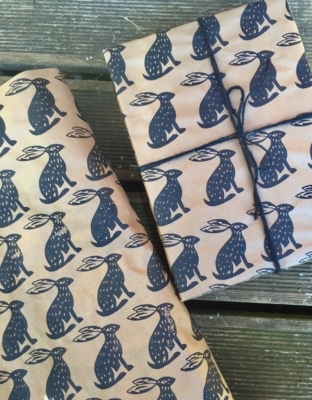 Leaping Hare – Looks fantastic jumping through an array of Seed Heads, and very striking alternative wrapping paper (especially printed in Black!) 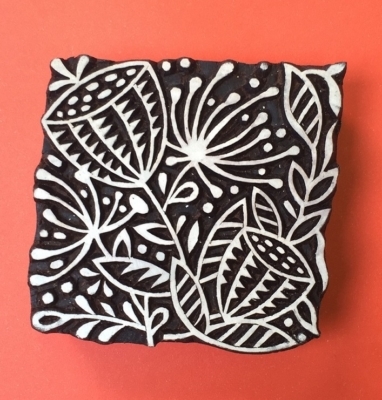 It’s a design which should be part of everyone’s Block Printing collection! 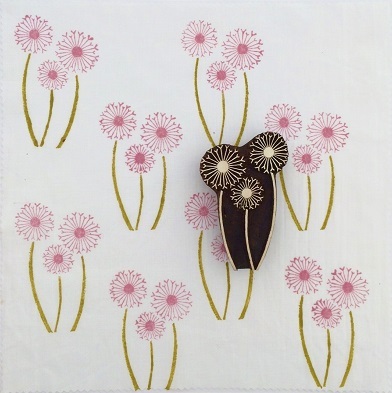 Meadow – Use on the front of a card, or all over as a repeat design it can’t look anything but PERFECT! The detail in this design is just exquisite and catches everyone’s eye! 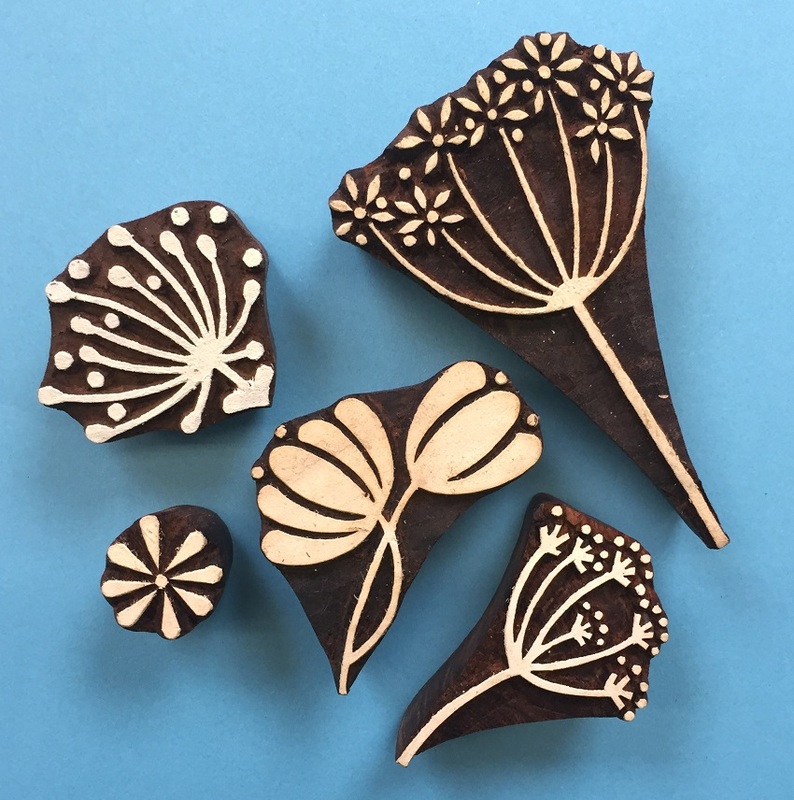 Set of Seed Heads- This set has a great mix of Seed Heads, which work really well together or as individuals! Very simple to use all in one colour but looks so effective! 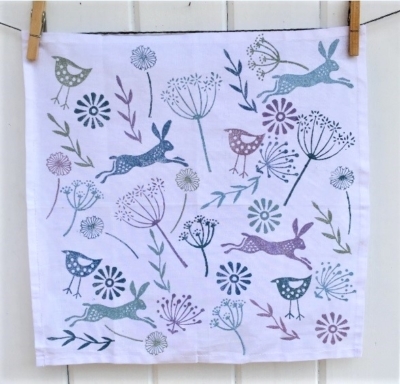 Love combining the Seed Head Set & a Leaping Hare for a Meadow Tea Towel! 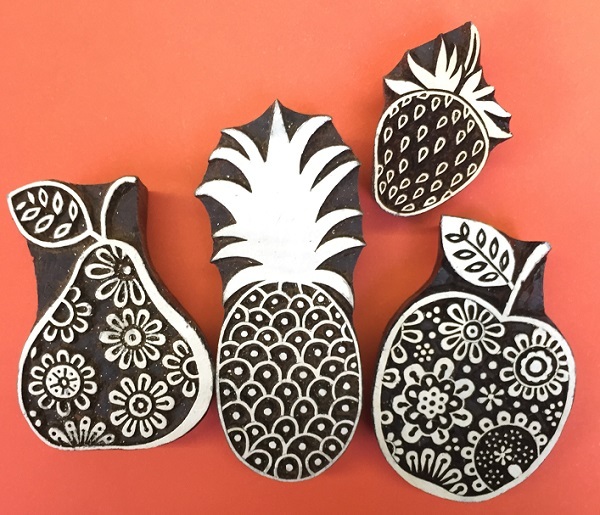 Our new Funky Fruits set is an excellent addition to anyone’s Wooden Block Printing collection! 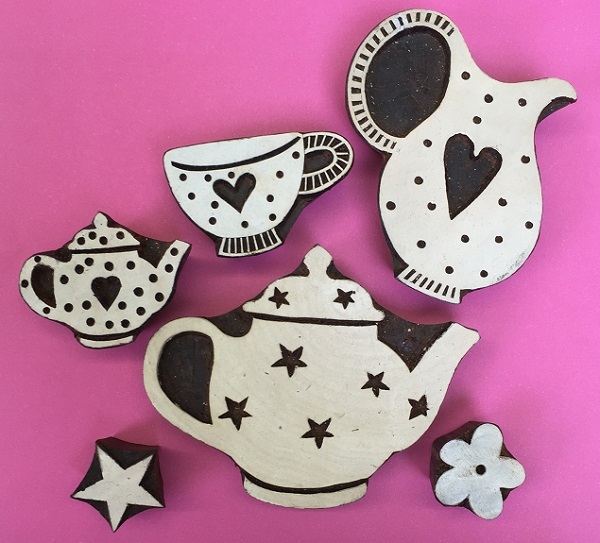 You may already have several blocks from this set, but don’t worry all 4 designs can be purchased separately, and can be found in the ‘Afternoon Tea’ Block category! 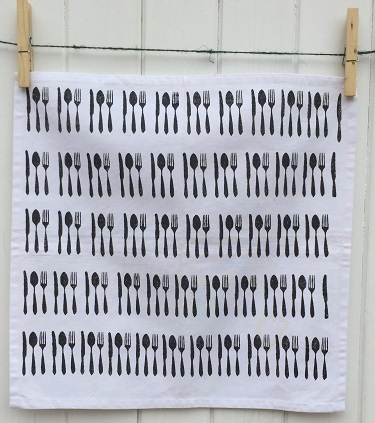 Really love this set of 4 kitchen Tea Towels printed using the 4 blocks from the set. 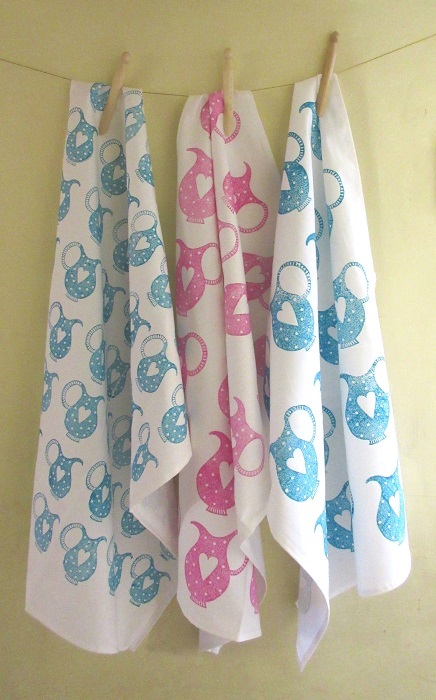 These were really inspired by Susy Jacks Tea Towel designs, which I saw on Pinterest a year or so ago! 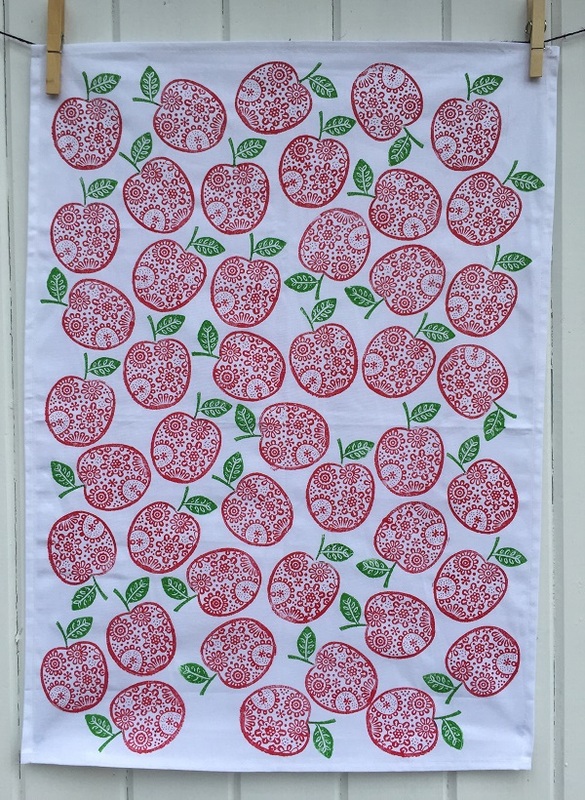 I love the non-alignment of the printing and how it doesn’t have to be kept in rows, the randomness of the prints really adds to the overall finish of the Tea Towel (It’s also good for those who can keep in straight lines)! I found it a really easy & fun way to print, the only tricky bit was fitting the last few prints in as you quickly run out of space, but you really don’t need to plan your prints or anything, just keep changing the angle you print at! 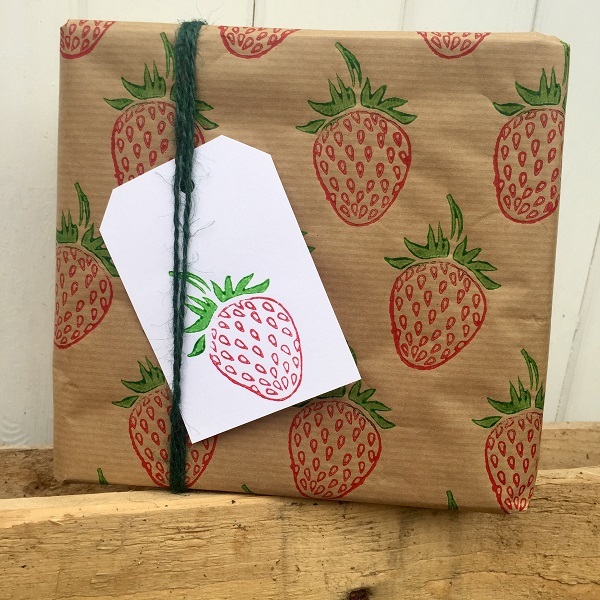 Hand printed Strawberry wrapping paper, such a funky way to wrap up a special present! All of the blocks on this set would make fantastic alternative wrapping paper & Cards! 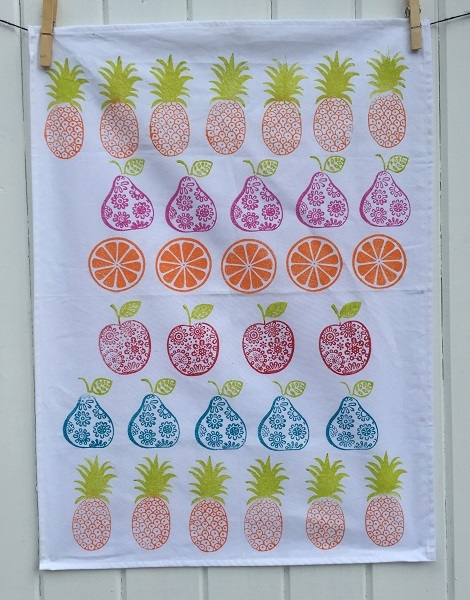 Here are a couple of other Tea Towels we printed using the Funky Fruits Set! Please click here to head to the product page and see more specific details about the printing set & sizes of each design! 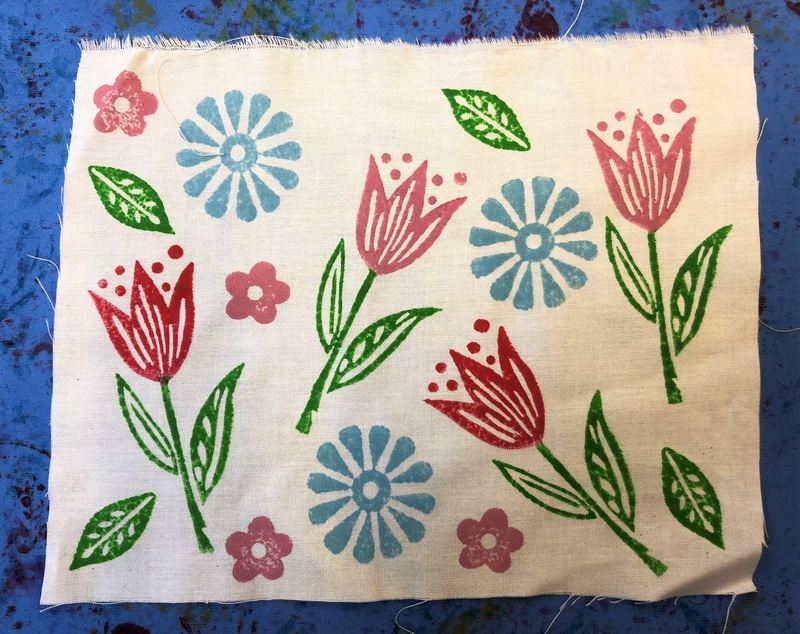 Our Indian Block Craft Printing Project this fortnight is hand printing your own set of Napkins! Just click on the video to watch or head to our youtube channel to see this video and others! 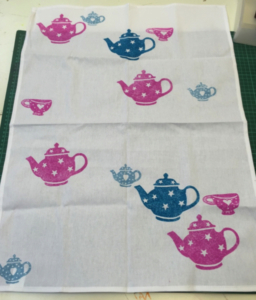 Don’t forget you don’t need to follow us, you can use whatever colours and printing blocks suit you! 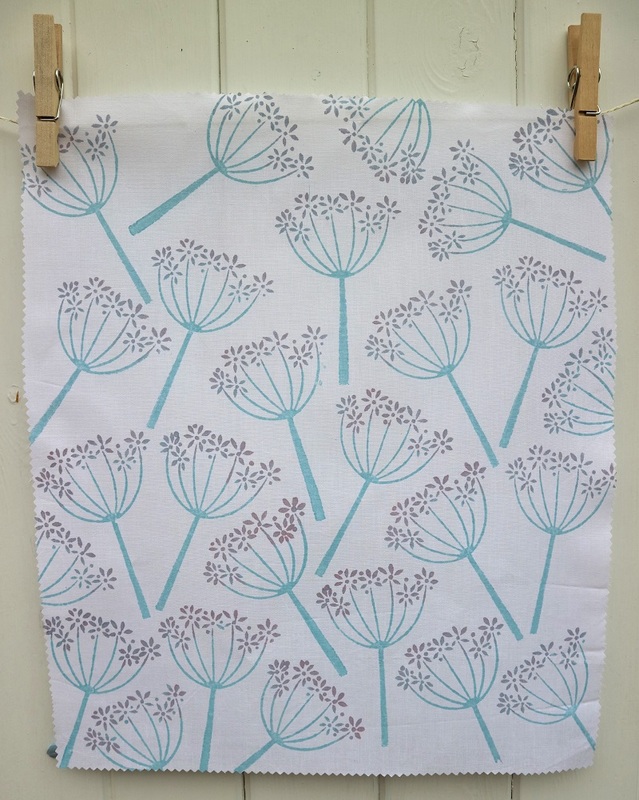 We have a deal currently running, 4 fabric paints for £10.00 which is perfect for this project! Please click here to head to the product page to see more and order this set! We thought we would show examples of cards and envelopes with various blocks from the set! 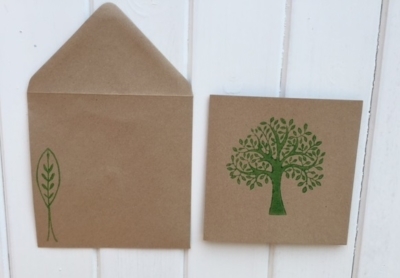 The large Spring Tree fits perfectly in the centre of the card, and looks great printed in different colours! 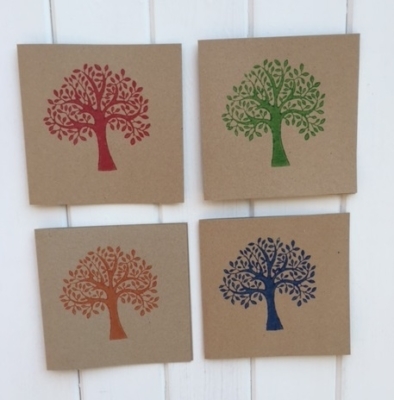 These are just plain brown square craft cards I brought from my local craft shop, we also sell packs of plain cards and gift tags on our website. 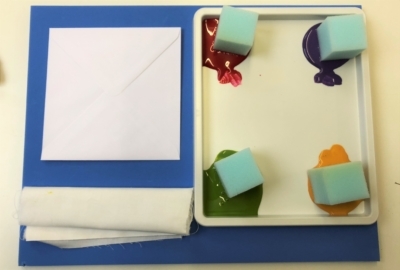 I actually used fabric paints on these cards, I went with Terracotta, Brilliant Blue, Red and Grass Green, but you can also use poster paints and acrylics when printing onto paper or card! 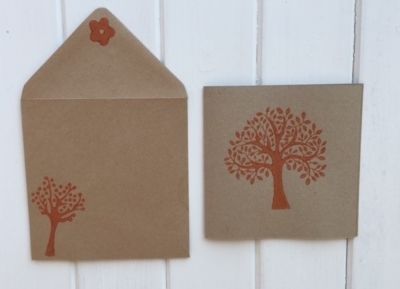 Hand printed matching envelopes with different blocks from the set. 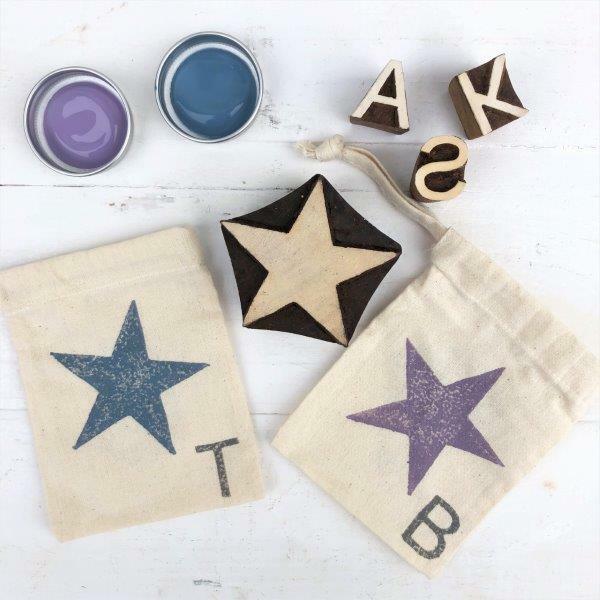 The smaller blocks are the perfect size for hand printing your own gift tags ! 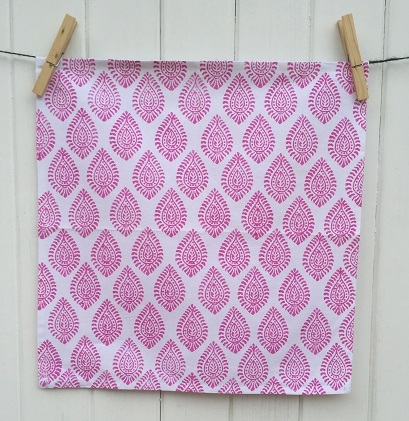 I also LOVE these Tea Towels which we printed using the printing blocks from the set! 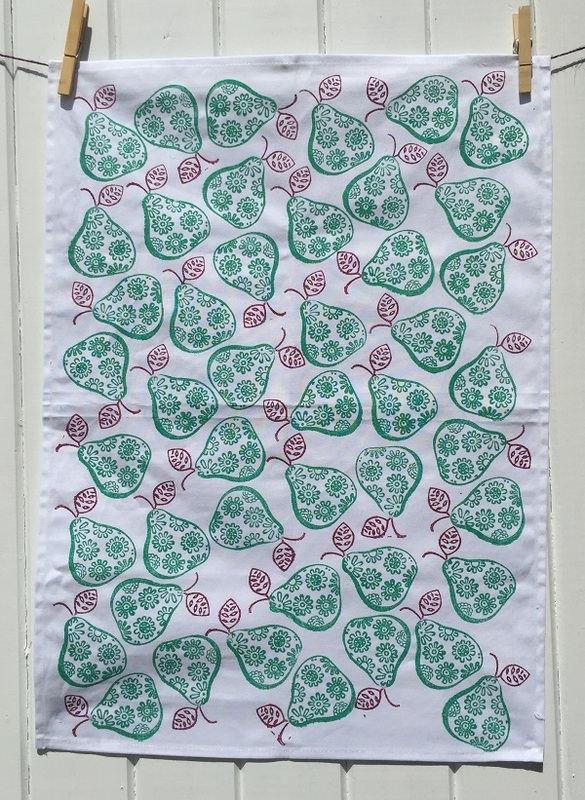 The first fabric Tea Towel is printed in Olive Brown Fabric paint and the second one is printed in Olive Green Fabric paint! 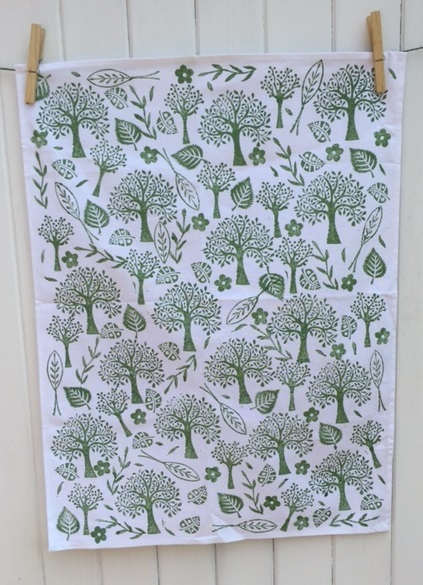 I started off by printing the largest block randomly all over the tea towel first which is the Spring Tree and then used all the other blocks to fill in the white space! 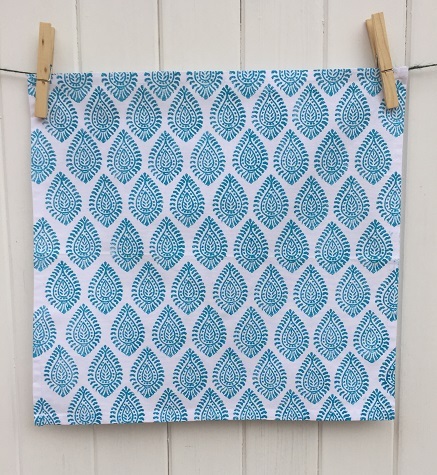 I love just using one colour for printing, I think it looks so effective, I can really imagine a set of 4 tea towels all using the same blocks but 4 different colours! 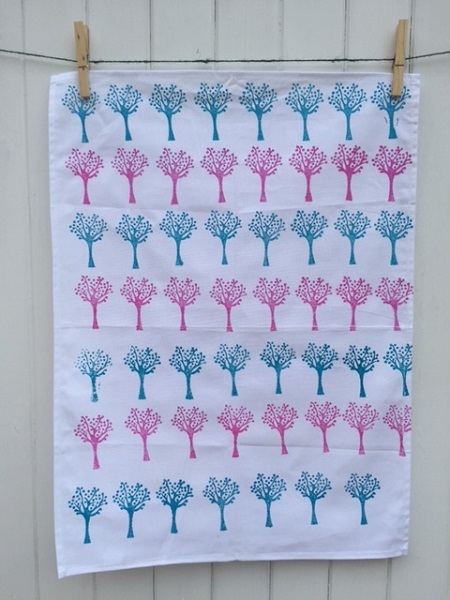 Here I am using the small dotty tree for a funky pink and turquoise Tea Towel! 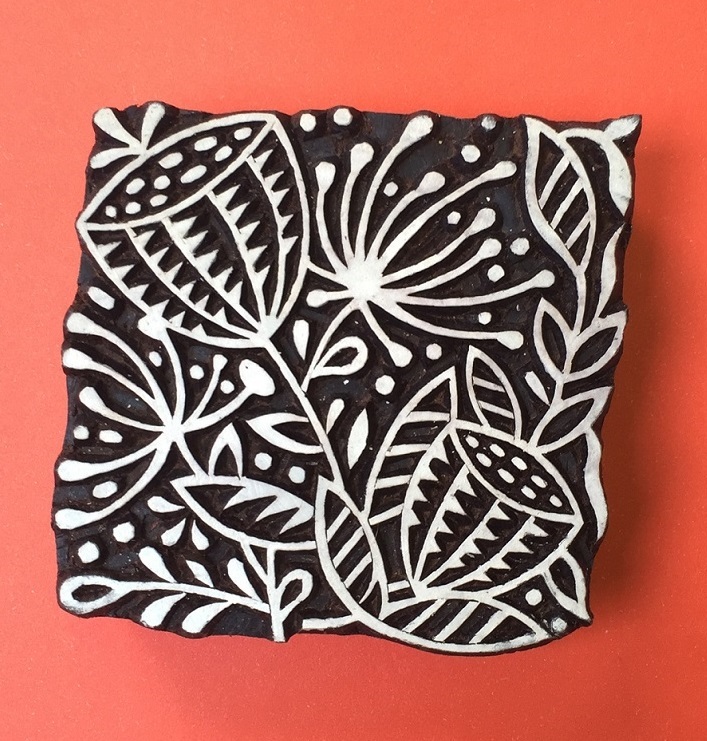 Our 2nd featured Indian Wooden Printing Block this May is our Large Seed Head Repeat Design! 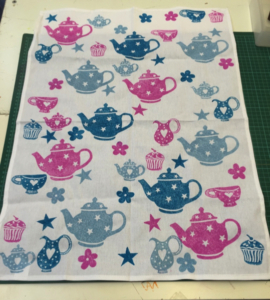 This is another really popular design, especially once customers have seen how it looks printed. 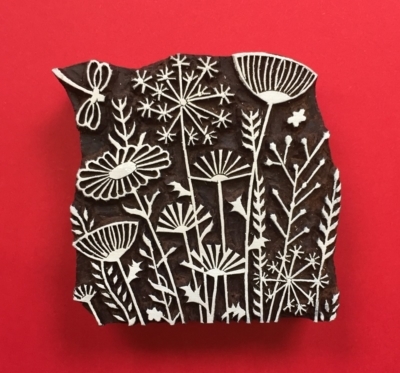 Sometimes it is not enough to see a photograph of the printing block online or at a show amongst all the other designs but once people have seen what it looks like printed, they have to have it!! If you have seen us at various shows you may have seen our Cushion Cover sample which is printed with the Seed Head Repeat! Doesn’t it look FABULOUS! 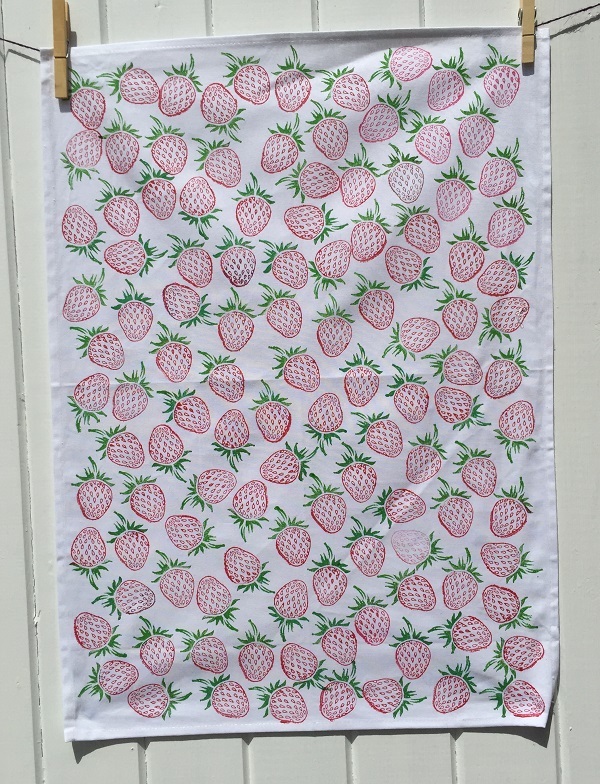 We have just printed onto one of our Natural Blank Cushion Covers which we sell for £5.00, they are fantastic quality with a zip closure. 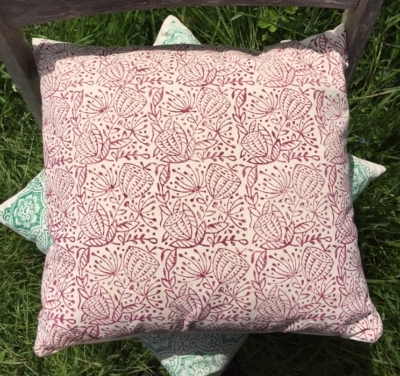 You could also just print onto any old cushion covers that could do with a new lease of life! 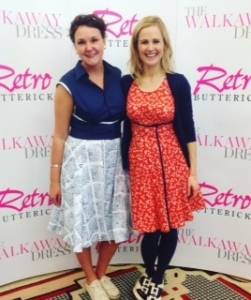 At WI Centennial Fair last year we met the lovely Jenniffer Taylor who was a contestant on the Great British Sewing Bee, she was amazing and made it to week 5!! I’m sure much to Jenniffer’s disappointment she was beaten by a pair of velvet trousers!! 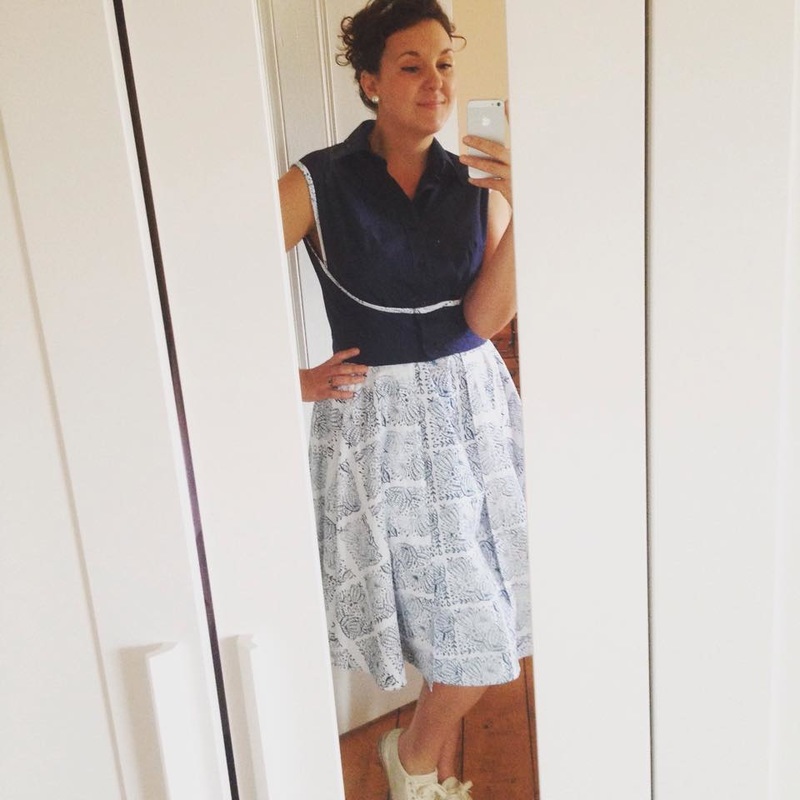 Since then she has started the Sewing Revolution, and is currently running workshops in and around the midlands based around upcycling and encouraging people to sew! 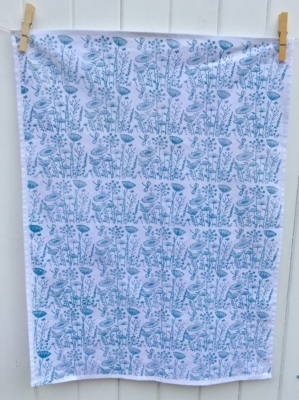 Jenniffer was attending an event in London, to which she had to make her own dress, and it turns out she used our Large Seed Head Printing Block and printed part of her fantastic dress! 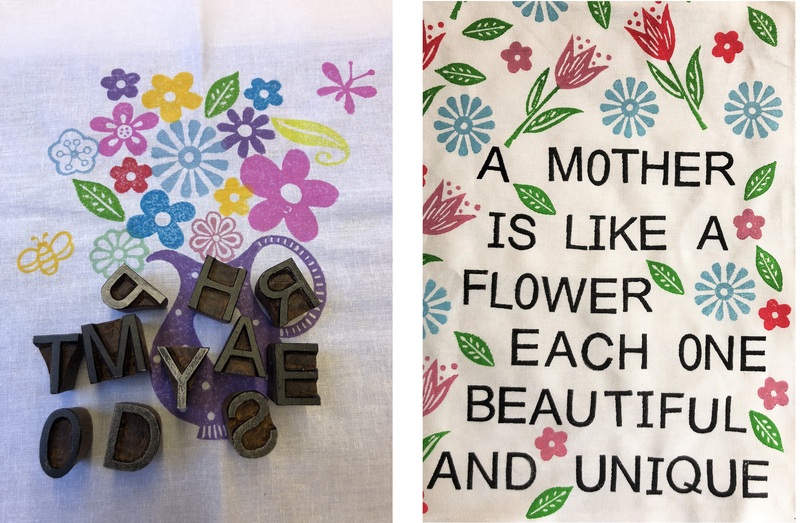 Please click here to read Jennifer’s full Blog post, and learn more about how she made this fantastic block printed dress! 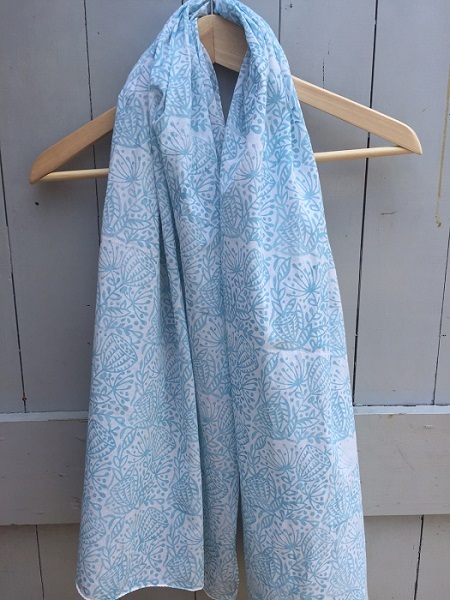 Another item which we had a lot of fun printing onto was one of our White Blank Scarves these are also £5.00, and print beautifully! 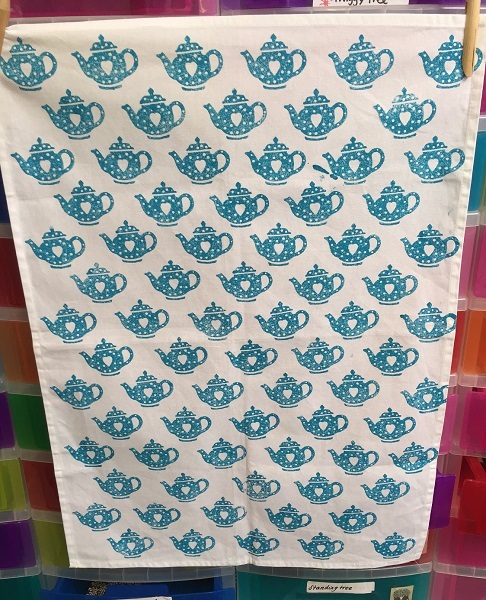 Again printing as a repeat design looks fantastic, and also if you make any little mistakes you just don’t notice once you have finished! 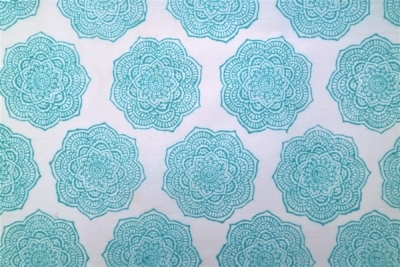 I used our Fabric Paint in Duck-Egg Blue, I only used half a 60ml pot! 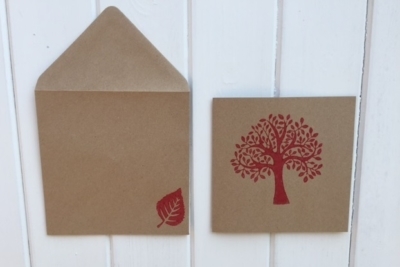 You don’t just have to print onto Fabric, the design also looks fantastic printed onto card, and even wrapping paper! 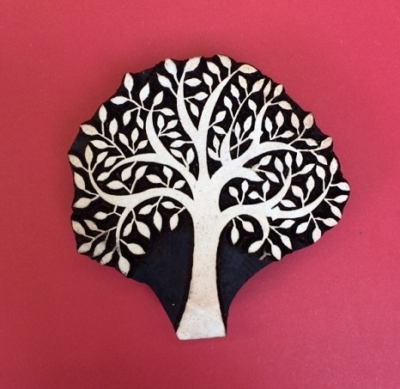 This is a fantastic printing block, which can be used in so many different ways! Dont forget, you can purchase for the next 2 weeks for only £11.50! 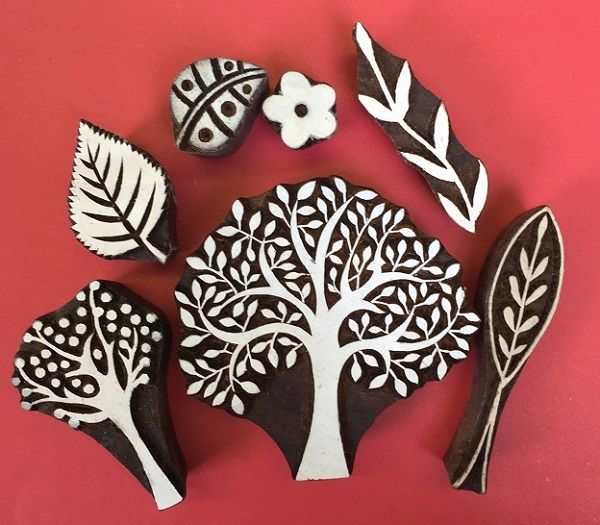 You may not have seen already but we are starting to add to the website a whole mixture of Block Printing Set’s which are available to purchase, we have sets ranging from mixtures of Paisleys to Trees & Leaves to Hedgehogs- so hopefully there is something there for everybody! 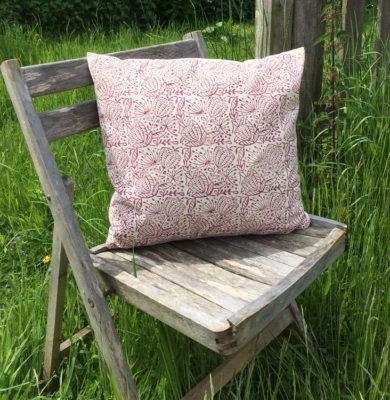 These are a fantastic way to build up your selection of blocks with coordinating designs, or to buy as a wonderful gift for someone. 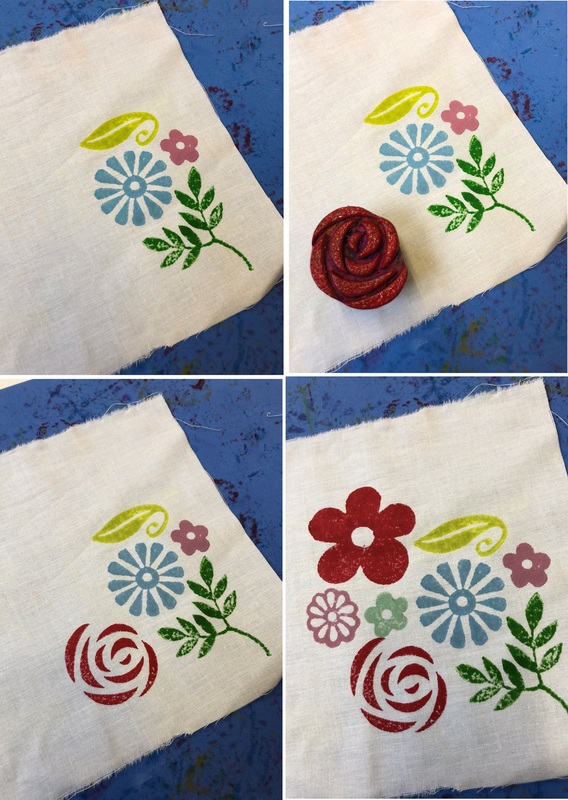 Each fortnight we will be focusing on a different block printing set and showing you what you can make & create with it! 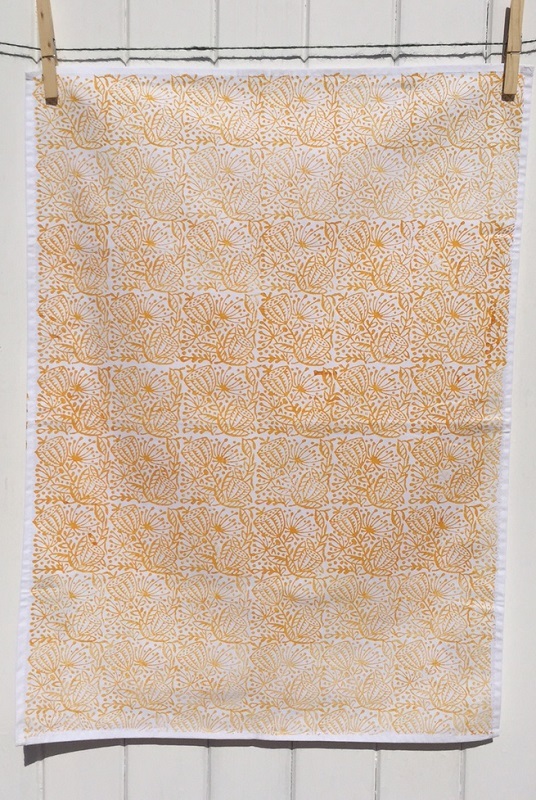 The Block Printing set will also be on special offer for 2 weeks at super discounted price! 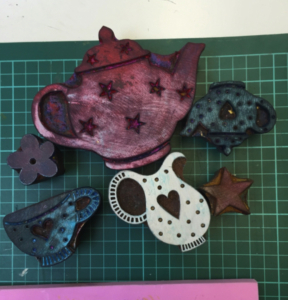 The first set we are looking at is the Afternoon Tea Block Printing Set which is made up of 6 different Indian wooden printing blocks! 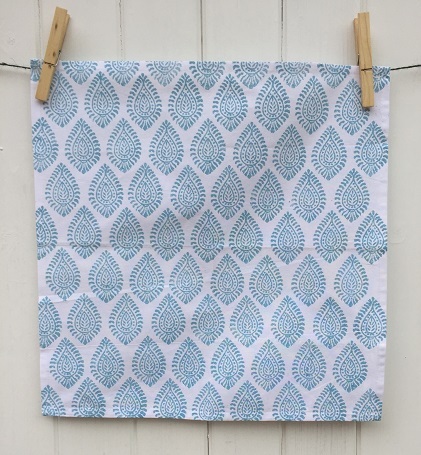 The selection of blocks really is aimed at using them for printing Tea Towels & kitchen fabric with, but are also versatile enough that you can explore using them in different ways! This set is on special offer for a short period at only £39.00, the set is actually worth £55.50! Click here to purchase this amazing printing set! 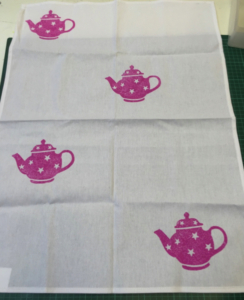 The photograph of the Tea Towel below is one we printed using the whole of the Afternoon Tea Block Printing Set, it’s so easy to create a wonderful hand printed item with a selection of different blocks and colours, Please scroll down to see our step-by-step guide of how to print your own Afternoon Tea Tea Towel! Or scroll down to the bottom of the page to see what other printing we have been doing with the printing set. 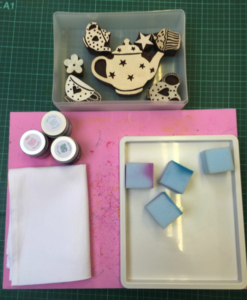 Lay your printing blocks out ready, mine are colour stained as I have used them before. 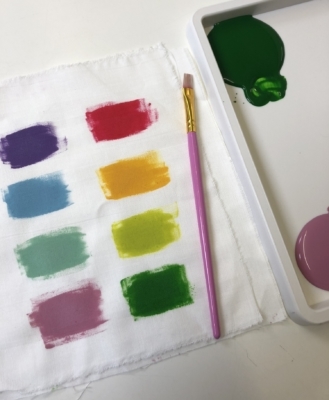 If you are using brand new printing blocks ensure you do some test printing first on scrap fabric or paper as the blocks need to absorb a tiny bit of the paint, your first prints are never your best. Even if your printing blocks aren’t brand new, it’s always a good idea to do a few practice prints first! 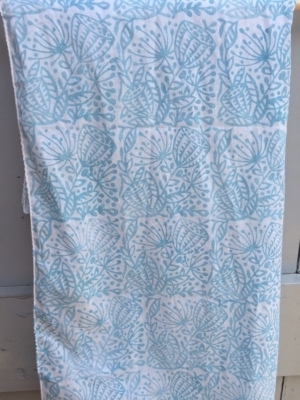 It’s not a very well known fact that you must ALWAYS have something soft underneath you when you print to ensure you always get a good print result, because the blocks aren’t always flat you need to be able to give them a good wiggle when printing, so a foam board or old towel will allow you to do that. 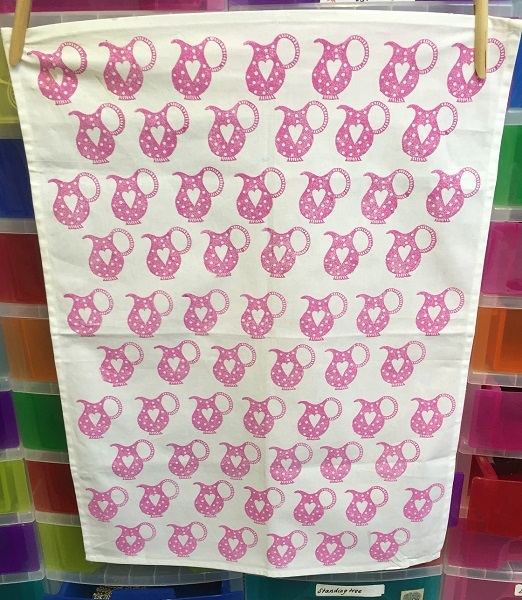 Lay your Tea Towel out on your foam board, and remember to move the foam board down the Tea Towel as you love with your printing. Slowly try and rock the block to make sure all the edges have been printed- being careful not to twist the block as this will smudge the paint! 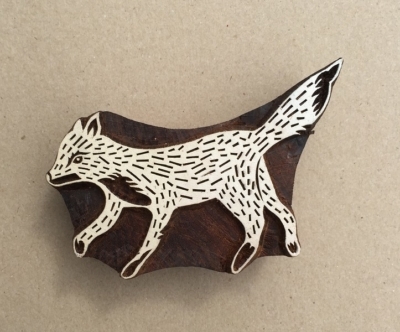 With a design like this it’s much easy to print with the same block and colour several times, this way its much quicker to build up your design. It’s rather hard to fit a large block into a small space! You can use whichever blocks you want, in any order! The brilliance of the set is that all the designs are really versatile, and don’t need to go in any order. 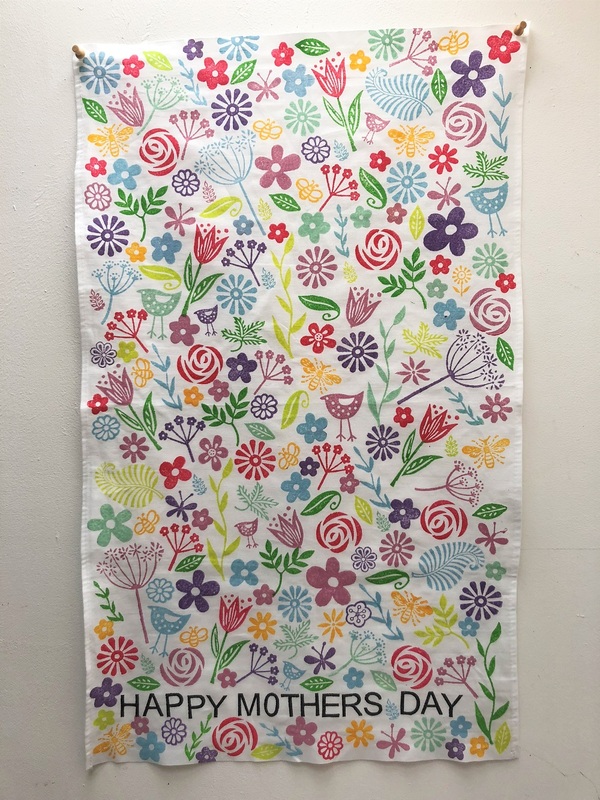 Have a play around with the order in which you use them in and where about you place them, when printing a design like this you don’t know what it’s going to look like until the end, but keep printing- it’s going to look FAB! fill all of it in- this way it doesn’t look too busy! 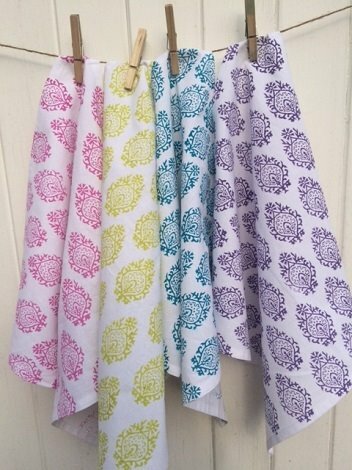 Once you’re happy with your design leave your fabric to dry! Don’t forget to set the fabric paint by either ironing or tumble drying your item, once you have done this you’re finished! 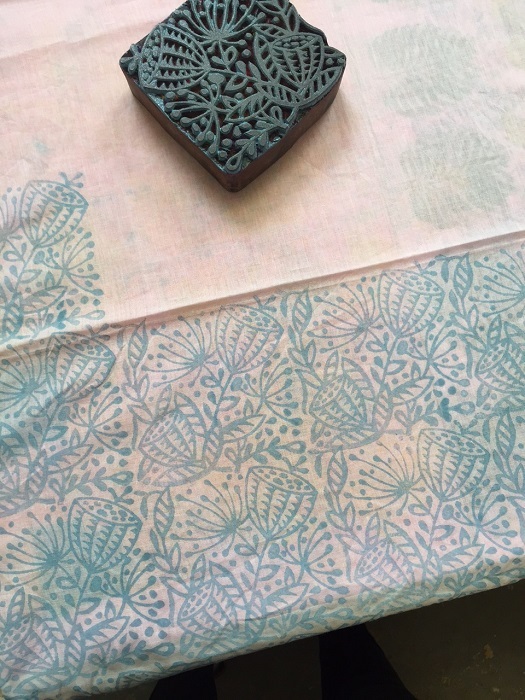 So if you haven’t already had a go at this either at home or on one of our workshops, hand printing your own Tea Towels with Indian Wooden Printing Blocks is such a fabulous, fun and therapeutic project! 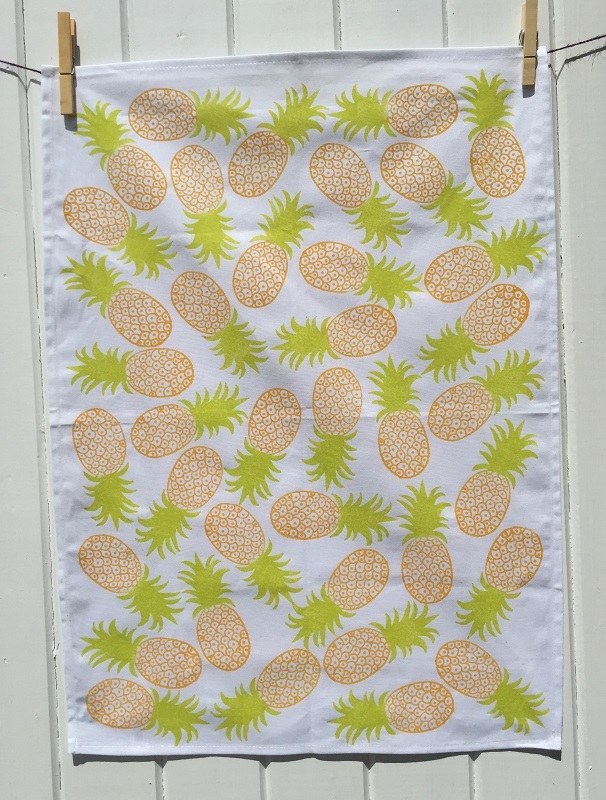 There are so many creative ways to use your printing blocks, and printing your own Tea Towels is just such a quick, easy and rewarding project for yourself, I really like to print them as gifts for Christmas & Birthdays and its great because you can personalise them to the person you will be giving it to by choice of colours and designs! 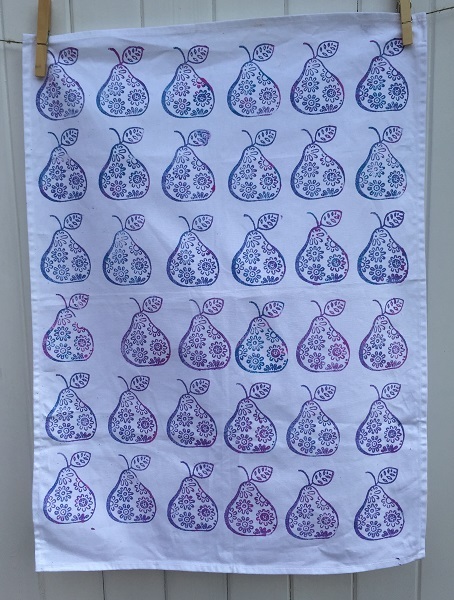 I had a clean out not so long ago and threw out all my old boring tea towels and filled my draw with unique and funky new ones, I have built up quite a collection as we are always printing tea towels as our samples when we are at shows & events, so I admit I may have had a slight head start- but this doesn’t mean you can’t do the same! 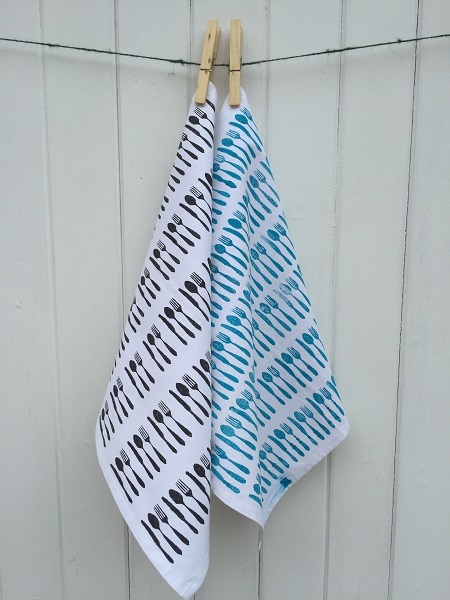 Printing your own tea towels give you the freedom to choose your own colours and designs and create something that you just couldn’t buy in any shop! Please be aware the video is a bit hap hazard! Maggie who was filming seemed to record everything she wasn’t meant to and at the point when she was meant to press the record button she switched the recording off! (Please stick with it, this is all a bit new for us!) But we have managed to somehow create a video, so hopefully it makes sense! 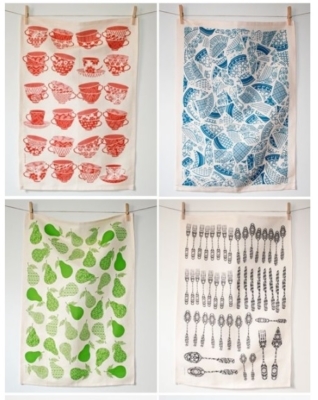 Hope you have enjoyed our first video and it has inspired you to print your own Tea Towels! 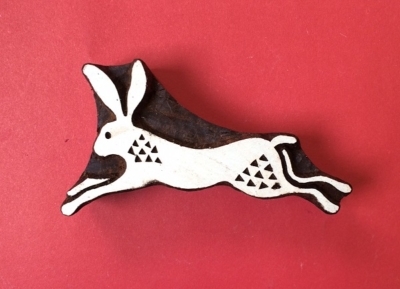 One of our featured blocks this month is our hugely popular ‘Sitting Hare’ wooden printing block! 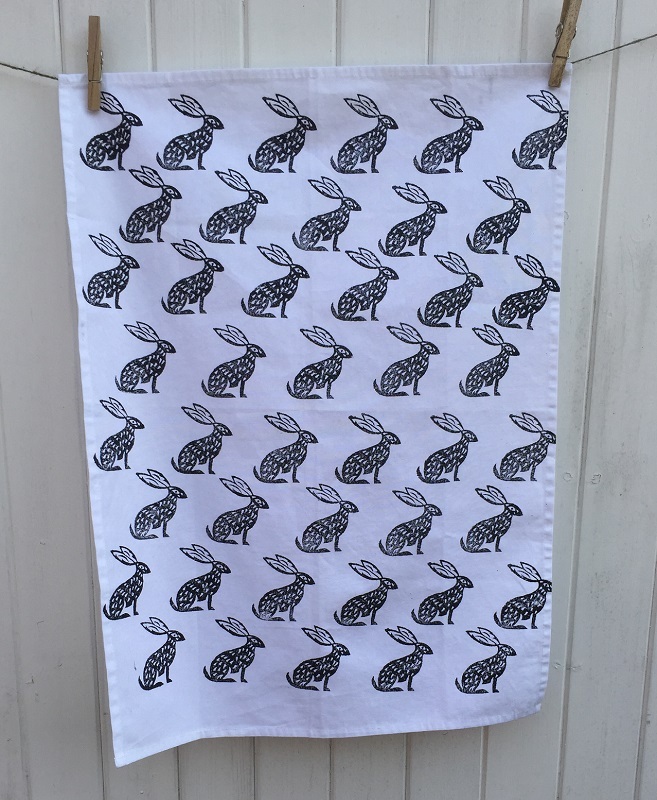 Hares do seem to be massively popular at the moment, everywhere we go we seem to see a beautiful printed card, or fabric with an array of different styled Hares, possible it’s the time of the year, or just what’s currently in fashion. For anyone who’s interested I stumbled across an article about ‘Hare Mythology’ on THE FIELD website, please click here if you would like to take a read of the article, it might shed some light on why we are all so mad about Hares! 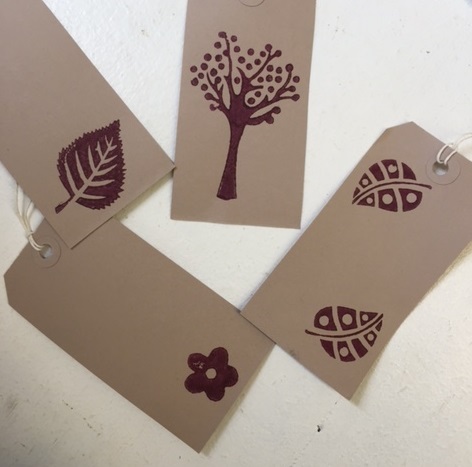 Printed gift tags are the perfect addition to your hand block printed wrapping paper! 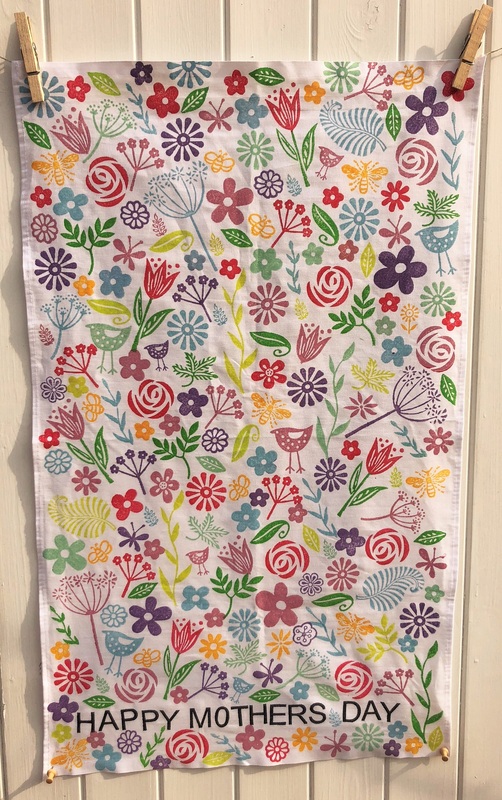 The annoying thing is for me, is that I always print my paper, and it looks so fabulous I’m in such a rush to dry the paper and wrap up the gift I forget about printing the tag, Until I have wrapped the present up and think … ‘ well where’s my matching tag???’. 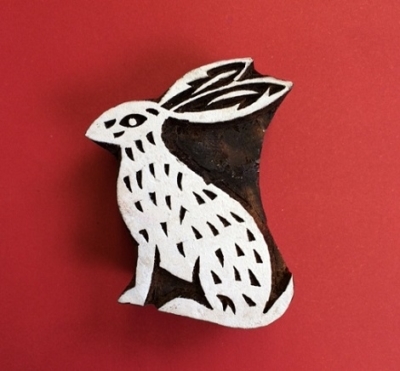 The sitting Hare block only just fitted onto the tag that I was using, so I had to print on a bit of a slant which I don’t mind, but if you had a bigger tag you could print him sitting straight. 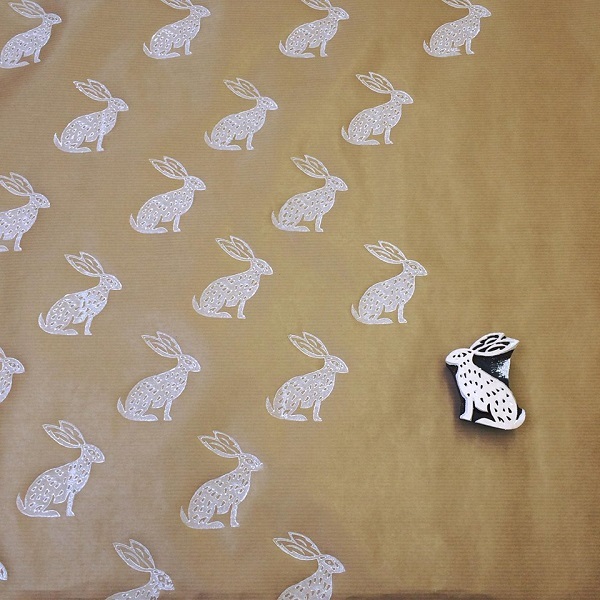 Here is some of the wrapping paper I printed when we first ordered the Hare design. For the wrapping paper we always use simple brown paper, I think it may also be called brown package paper, you can find it in the pound shop, or online in big bulk rolls! We can get enough of it, it’s is perfect all year round whether it’s for Birthdays or Christmas, and it suits every occasion! 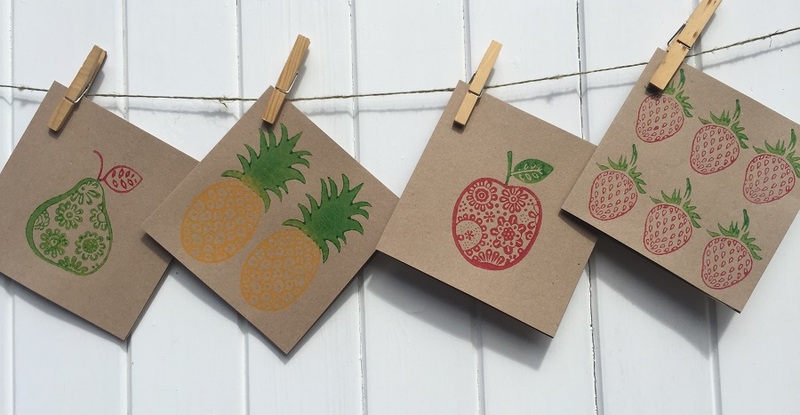 Lots of people we speak to at shows say they already wrap presents in brown paper and string, so why not do some easy Block Printing and bring your brown paper to life! I decided to print in Black and White which really makes the Hare stand out, I was a bit hesitant at first, thought it might be a bit boring, but I think it works really well. 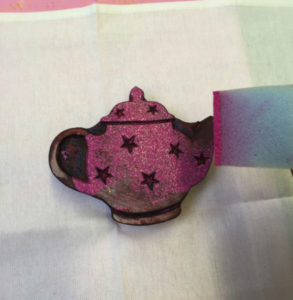 When printing paper you can use any paint, I used acrylic paint. When you start printing make sure you get your first line straight, and then you can follow on from that. 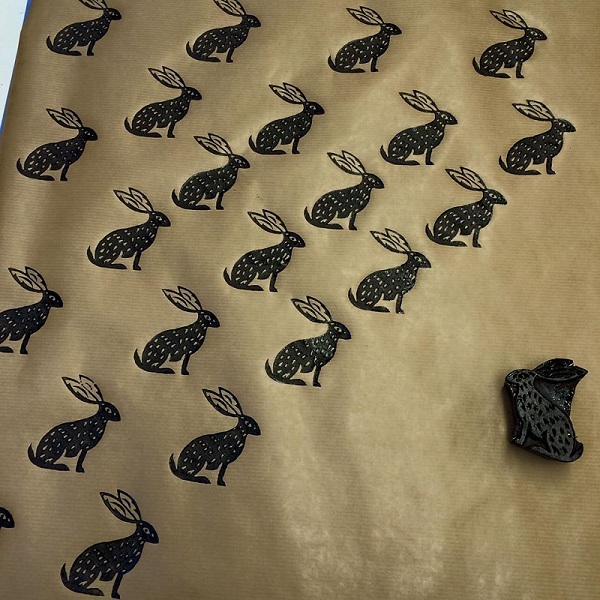 As you can see with my printing I have printed the next row of Hares in the gap of the row above, it really doesn’t matter if you go a bit wonky or make a mistake. 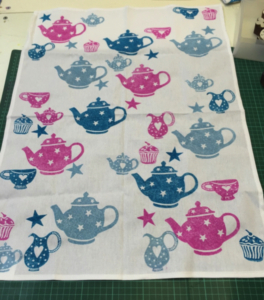 Remember it’s all hand printed, it’s not meant to be perfect!! 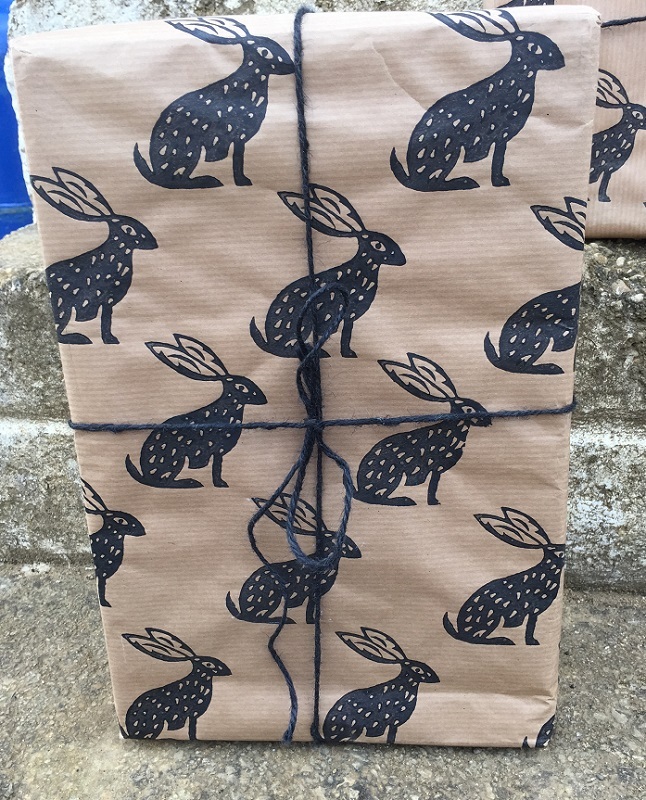 I think the wrapping paper looks fab, it’s very alternative and striking, it’s also a design which you can use all year round. 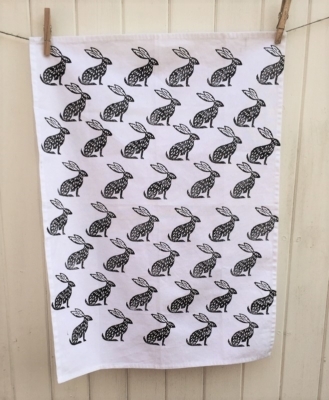 Another great way to use the Hare is block printing onto Tea Towels, when printing onto fabric always remember to use a fabric paint so your item is washable! I think it’s a great addition to any kitchen. 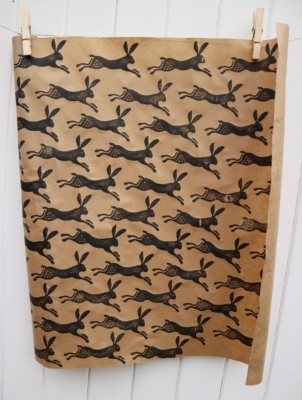 As I said, Hares are so popular at the moment, what’s the point in buying something when you can print your own!! 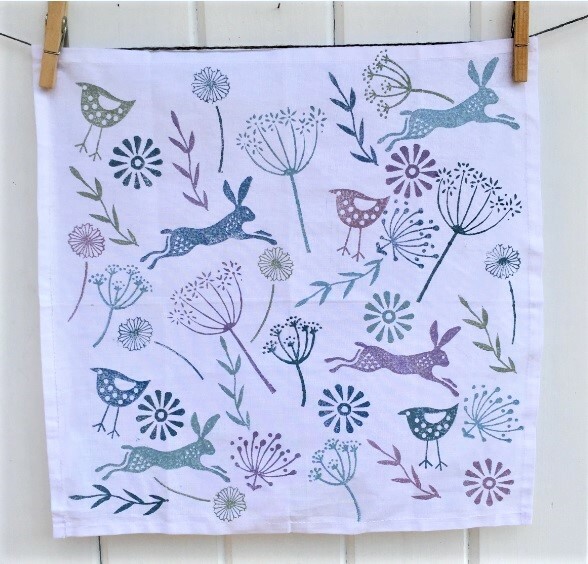 If you love Hares as much as we do, and love the idea of block printing with Hares as much as we do, then please keep an eye out as we have new designs coming in shortly, and we have ordered several more styles of Hare!